This is a timeline of the War in Donbass, from 1 to 31 August 2016. The timeline follows an ongoing conflict between Ukraine and anti-government pro-Russian separatists supported by Russian troops in the Donbass region in eastern Ukraine. According to the information provided by the ATO HQ on their Facebook page in the morning, pro-Russian troops had opened fire on 85 occasions on Ukrainian troops during the last day of July. The spokesman of the Presidential Administration on issues related to ATO, Andriy Lysenko, reported at noon that one Ukrainian serviceman was killed and six others were wounded in action in the Donbass region on 31 July. Pro-Russian officials denounced that Ukrainian troops fired upon their forces on 850 occasions using small arms, rocket launchers, 82 mm mortars, 120 mm mortars, armoured fighting vehicles, 122 mm and 152 mm self-propelled artillery. The incidents took place at Zaitseve, Shyroka Balka, Mineralne, Yasynuvata, Luhanske, Oleksandrivka, Belaya Kamyanka, Kominternove, Sakhanka, Leninske, Sosnovske, Novolaspa, Donetsk airport, Kuibyshev and Petrovsky districts. One civilian resident was reported killed. The self-styled Luhansk People's Republic reported two Ukrainian violations of the ceasefire in the area under their control. Kalinove was the target of automatic grenade launchers firing from Troitske, while pro-Russian entrenchments around the Knyaz Igor memorial came under 82 mm mortar fire from Stanitsya Luhanska. The press-centre of the ATO HQ reported in the evening that by 6:00 pm pro-Russian troops had opened fire on Ukrainian positions on 22 occasions. Around Donetsk city, the rebels fired heavy machine guns and 82 mm mortars on the Ukrainian stronghold of Avdiivka, Nevelske and Troitske. Krasnohorivka came under small arms and rocket propelled grenades. In the area of Horlivka, Ukrainian forces at Luhanske were the target of small arms, heavy machine guns and rocket launchers, while heavy machine gun fire and 82 mm mortar volleys struck several Ukrainian redoubts in the surroundings of Horlivka itself. In the region of Mariupol, Ukrainian troops at Hnutove were the target of small arms fire and rocket propelled grenades. Small arms fire was also reported at Taramchuk, while antitank rockets landed in Novomyhailivka. There were close-combat clashes between the warring factions near Avdiivka, Opytne and Luhanske. One male civilian was killed and a female civilian injured as a result of shelling of Yasynuvata. The press-centre of the ATO HQ reported in the morning that pro-Russian troops had opened fire on 54 occasions on Ukrainian positions the previous day. The spokesman of the Presidential Administration on issues related to ATO reported at noon that two Ukrainian servicemen were wounded in action in the Donbass region on the first day of August. Separatist authorities reported that Ukrainian forces opened fire on their troops on 466 occasions. The Ukrainian military employed small arms, rocket launchers, 82 mm mortars, 120 mm mortars, armoured fighting vehicles, 122 mm and 152 mm self-propelled guns to attack rebel positions at Zaitseve, Horlivka, Yasynuvata, Spartak, Vesele, Zhabicheve, Zemlyamki, Kominternove, Sakhanka, Donetsk airport, Kuibyshev and Petrovsky districts. The same sources recorded eight Ukrainian army violations of the truce inside the boundaries of the self-proclaimed Luhansk People's Republic. Ukrainian tanks pounded pro-Russian redoubts at Kalinove, supported by automatic grenade launchers, 82 mm and 120 mm mortars. Molodezhne was fired at by automatic grenade launchers from Popasna. The settlements of Mironovskiy and Stakhanov were the target of 152 mm self-propelled artillery. The press-centre of the ATO HQ reported in the evening that pro-Russian troops had opened fire on Ukrainian positions on 28 occasions throughout the day. The main target continued to be the stronghold of Avdiivka, struck by 82 mm and 120 mm mortar barrages. Also in the outskirts of Donetsk city, pro-Russian tanks attacked Ukrainian redoubts at Marinka, while Pisky was pounded by 152 mm self-propelled artillery. Krasnohorivka was shelled by 82 mm and 120 mm mortars, and Ukrainian troops at Troitske were harassed with heavy machine gun fire. Around Horlivka, the rebels pounded Ukrainian entrenchments at Kirove and Luhanske with rocket propelled grenades and 82 mm mortar rounds. In the region of Mariupol, 82 mm mortar volleys landed in Talakivka. In the northern sector of the demarcation line, Ukrainian forces at Novozvanivka received small arms and 82 mm mortar fire. According to the information provided by the ATO HQ in the morning, pro-Russian troops had opened fire on 71 occasions on Ukrainian positions on 2 August. The spokesman of the Presidential Administration on issues related to ATO, Andriy Lysenko, reported at noon that three Ukrainian servicemen were wounded and one contused in action in the Donbass region on 2 August. According to Donetsk People's Republic officials, Ukrainian forces opened fire 872 times on their troops using small arms, rocket launchers, 82 mm mortars, 120 mm mortars, armoured fighting vehicles, 122 mm and 152 mm self-propelled guns. The main targets were Zaitseve, Horlivka, Yasynuvata, Spartak, Vesele, Minerale, Oleksandrivka, Staromykhailivka, Dokuchaievsk, Novaya Tavriya, Kominternove, Sakhanka, Donetsk airport, Kuybishev and Petrovsky districts. One pro-Russian soldier was killed. There were 12 Ukrainian violations of the ceasefire inside the boundaries of the Luhansk People's Republic. The Ukrainian military attacked rebel positions at Sokolniki, Kalinove, Kalynivka, Lohvynove, Lozove and Knyaz Igor memorial with small arms, grenade launchers, 82 mm mortars, 120 mm mortars and armoured fighting vehicles. The press-centre of the ATO HQ reported in the evening that by 6:00 pm pro-Russian troops had opened fire on Ukrainian positions on 11 occasions. Heavy shelling was reported at Avdiivka, which came again under rocket fire and 82 mm and 120 mm mortar fire. Harassing fire against Ukrainian forces was also recorded at Krasnohorivka, as heavy machine gun at Troitske and Nevelske. Rocket propelled grenades, 82 mm and 120 mm mortar volleys landed in Maiorsk, west of Horlivka. In the region of Mariupol, Talakivka was the target of 82 mm mortar rounds and Ukrainian troops at Starohnativka received small arms fire. UN High Commissioner for Human Rights Zeid Ra'ad Al Hussein called on all parties to the conflict in eastern Ukraine to prioritize the protection of civilians and take urgent steps to de-escalate the increasingly tense situation at the contact line, warning that civilian casualty figures have risen dramatically in the past two months. The press-centre of the ATO HQ reported in the morning that pro-Russian troops had opened fire on 38 occasions on Ukrainian positions the previous day. The spokesman of the Presidential Administration on issues related to ATO, Oleksandr Motuzyanyk, reported at noon that seven Ukrainian servicemen were wounded in action in the Donbass region on 3 August. The deputy minister of defence of Donetsk People's Republic, Eduard Basurin, reported that Ukrainian forces opened fire on pro-Russian positions 466 times. The Ukrainian military used small arms, rocket launchers, 82 mm mortars, 120 mm mortars, armoured fighting vehicles, 122 mm and 152 mm self-propelled guns to pound the rebel strongholds of Zaitseve, Spartak, Yasynuvata, Sakhanka, Kominternove, Petrovsky district and Donetsk airport. Sources from Luhansk People's Republic said that Ukrainian forces broke the ceasefire on seven locations inside the republic's boundaries. Ukrainian BPM-1 armoured fighting vehicles shelled pro-Russian positions at Kalinove, supported by small arms and 82 mm mortar fire. Ukrainian armoured fighting vehicles also attacked pro-Russian redoubts at Kalynivka. Knyaz Igor memorial was the target of mortar volleys fired from Stanitsya Luhanska, while Lozove was hit by antitank grenades fired from Svetlodarsk. Rebel troops received harassing fire in the villages of Sokolniki, Krymske, and Lohvynove. The press-centre of the ATO HQ reported in the evening that pro-Russian troops had opened fire on Ukrainian positions on 22 occasions by 6:00 pm, and on 13 more occasions during the following 4 hours. In the area around Donetsk city, rebel forces fired rocket propelled grenades at Krasnohorivka and antitank guided missiles at Opytne. Avdiivka and Nevelske came under heavy machine gun and mortar fire, while sniper fire was reported at Marinka. North of Horlivka, Ukrainian outposts at Luhanske were raked with heavy machine gun fire. In the region of Mariupol, Vodiane became the target of heavy machine guns, rocket launchers, 82 mm mortars and 120 mm mortars. Rocket launchers were fired at Ukrainian redoubts in Taramchuk and Hranitne. Pro-Russian troops also fired small arms at Starohnativka and Novotroitske. In the northern section of the demarcation line, rocket propelled grenades landed at Novozvanivka and Lopaskyne. Voice of America expressed concerns over "Russia's steady buildup of military forces along its border with Ukraine." According to the information provided by the ATO HQ in the morning, pro-Russian troops had opened fire on 42 occasions on Ukrainian troops on 4 August. The spokesman of the Presidential Administration on issues related to ATO, Andriy Lysenko, reported at noon that two Ukrainian servicemen were wounded in action in the Donbass region the previous day. Pro-Russian sources reported three soldiers killed and two wounded over the past week. Ukrainian shelling also killed two civilian residents. Authorities from the self-proclaimed Luhansk People's Republic reported six ceasefire violations of the truce by the Ukrainian military inside their boundaries. Ukrainian BMP-1 armoured fighting vehicles from Luhanske attacked pro-Russian redoubts at Kalynivka. Lohvynove came under 82 mm and 120 mm mortar fire, while nearby Lozove was the target of 73 mm recoilless antitank guns. The press-centre of the ATO HQ reported in the evening that by 6:00 pm pro-Russian troops had opened fire on Ukrainian positions on 17 occasions, including on ten occasions in the region of Mariupol, on six occasions in the region of Donetsk city, and on one occasion in Luhansk region. In the region of Mariupol, pro-Russian armoured fighting vehicles attacked Starohnativka and redoubts manned by Ukrainian marines in Shyrokyne. The rebels shelled Bohdanivka and Chermalik with 82 mm mortars and pounded Hnutove with heavy machine gun fire. Small arms fire was reported at Vodiane. Around Donetsk city, 82 mm and 120 mm mortar volleys landed in Krasnohorivka and Maryinka, while Avdiivka was the target of heavy machine guns and grenade launchers. North of Horlivka, Ukrainian troops at Zaitseve received small arms fire. In the northern front, rebel forces fired automatic grenade launchers at Novozvanivka. The press-centre of the ATO HQ reported in the morning that pro-Russian troops had opened fire on 50 occasions on Ukrainian positions the previous day, including on 27 occasions in the region of Mariupol, on 20 occasions in the region of Donetsk city, and on 3 occasions in Luhansk region. The spokesman of the Presidential Administration on issues related to ATO reported at noon that two Ukrainian servicemen were wounded in action in the Donbass region on 5 August, two others were injured by explosion of a booby trap. Six Ukrainian servicemen were injured by a grenade explosion during military exercises. Two civilians were injured in the western suburbs of Donetsk city as a result of heavy Ukrainian shelling. Separatist officials reported 450 Ukrainian attacks on their positions using small arms, rocket launchers, 82 mm mortars, 120 mm mortars, armoured fighting vehicles, 122 mm and 152 mm self-propelled artillery The main targets were the strongholds of Zaitseve, Horlivka, Panteleymonivka, Spartak, Zhabunki, Belaya Kamyanka, Vasiilivka, Dokuchaievsk, Krasny Partizan, Oleksandrivka, Staromyhailivka, Sakhanka, Petrovsky district and Donetsk airport. Officials from Luhansk People's Republic reported three Ukrainian violations of the ceasefire inside the boundaries of the Republic. The Ukrainian military fired automatic grenade launchers, 73 mm recoilless antitank guns and 82 mm mortars at pro-Russian redoubts at Kalinove and Lohvynove. At around 08:00 am an explosion in Luhansk injured at least two, including one of the heads of the self-proclaimed Lugansk People's Republic, Igor Plotnitsky. According to the information published by the ATO HQ on their Facebook page in the evening, pro-Russian troops had opened fire on Ukrainian positions on 20 occasions throughout the day. An attack of pro-Russian fighters — that took place near Maryinka early in the morning — was beaten off by Ukrainian forces. In other areas around Donetsk city, 82 mm mortar rounds hit Avdiivka and Novoselivka, while Ukrainian entrenchments at Butivka mining complex and Pisky were pounded from 73 mm recoilless antitank guns. In Zaitseve, north of Horlivka, Ukrainian troops were harassed with small arms fire. In the region of Mariupol, rocket launchers were fired at the Ukrainian strongholds of Lebedynske and Pavlopil. Small arms fire was reported at Starohnativka and Novotroitske. Rocket propelled grenades landed in Krymske, Luhansk Oblast, in the northern front. According to the information provided by the ATO HQ in the morning, pro-Russian troops had opened fire on 54 occasions on Ukrainian troops on 6 August, including on 26 occasions in the region of Mariupol, on 23 occasions in the region of Donetsk city, and on five occasions in the Luhansk region. The spokesman of the Presidential Administration on issues related to ATO reported at noon that three Ukrainian servicemen were killed and four wounded in action in the Donbass region the previous day. Pro-Russian officials denounced 309 Ukrainian attacks on their troops using small arms, rocket launchers, 82 mm mortars, 120 mm mortars, armoured fighting vehicles, 122 mm and 152 mm self-propelled guns The Ukrainian miliyary targeted Zaitseve, Horlivka, Shyroka Balka, Vesele, Yasynuvata, Spartak, Oleksandrivka, Staromykhailivka, Olenivka, Kominternove, Kulikove, Sakhanka, Petrovsky and Kuybishev districts and Donetsk airport. According to sources from Luhansk People's Republic, Ukrainian forces broke the ceasefire agreement on five occasions inside the republic's borders. Pro-Russian forces came under 82 mm and 120 mm mortar fire at Lozove, Nyzhne Lozove, Lohvynove and Kalinove. The press-centre of the ATO HQ reported in the evening that by 6:00 pm pro-Russian troops had opened fire on Ukrainian positions on 22 occasions. Heavy shelling was reported at Krasnohorivka and Avdiivka, where the Ukrainian defenders came under 82 mm and 120 mm mortar fire. Mortar fire also struck nearby Maryinka. Troitske was the target of grenade launchers, while pro-Russian armoured fighting vehicles shelled Ukrainian redoubts near Krasnohorivka and Pisky. The rebels attacked Luhanske, north of Horlivka, with heavy machine gun fire and grenade launchers and bombarded Maiorsk with banned 122 mm self-propelled artillery. In the region of Mariupol, Pavlopil was shelled from 82 mm mortars, while Starohnativka received heavy machine gun fire and Talakivka small arms fire. Pro-Russian armoured fighting vehicles shelled Shyrokyne. In the northern section of the demarcation line, Ukrainian forces at Novozvanivka and Popasna received heavy machine gun fire. The press-centre of the ATO HQ reported in the morning that pro-Russian troops had opened fire on 61 occasions on Ukrainian positions on 7 August, including on 32 occasions in the region of Mariupol, and on 12 occasions during the first six hours of 8 August. The spokesman of the Presidential Administration on issues related to ATO reported at noon that eleven Ukrainian servicemen were wounded in action in the Donbass region the previous day. According to separatist sources, Ukrainian forces opened fire on rebel positions on 320 occasions. The Ukrainian military employed small arms, rocket launchers, 82 mm mortars, 120 mm mortars, armoured fighting vehicles, tanks, 122 mm and 152 mm self-propelled artillery. The main targets were Zaitseve, Horlivka, Krasny Partizan, Yasynuvata, Spartak, Mineralne, Oleksandrivka, Staromykhailivka, Dokuchaievsk, Kominternove, Sakhanka and Petrovsky district in Donetsk city. One pro-Russian soldier was killed and two others wounded. Sources from the Luhansk People's Republic claimed that Ukrainian troops broke the ceasefire on eight occasions inside the territory of the self-proclaimed republic. The Ukrainian army used 73 mm recoilless antitank guns, 82 mm mortars, 120 mm mortars, BMP-1 armoured fighting vehicles, 122 mm and 152 mm self-propelled artillery to shell Lohvynove, Lozove, Vesela Hora and Donetskiy. According to the information published by the ATO HQ on their Facebook page in the evening, pro-Russian troops had opened fire on Ukrainian positions on 18 occasions throughout the day. Around Donetsk city, Avdiivka was the target of heavy machine guns, rocket launchers, 82 mm and 120 mm mortars, while machine gun fire was reported at Kamyanka. Nearby Troitske came under 82 mm and 120 mm mortar fire. North of Horlivka, pro-Russian forces fired grenade launchers at Ukrainian troops near Luhaske. In the region of Mariupol, artillery rounds landed in Shyrokyne, which was also hit by 120 mm rocket propelled grenades. The same kind of rocket launchers were fired at Ukrainian forces in Vodiane. The Ukrainian garrison at Hnutove was harassed with small arms fire and rocket propelled grenades. Small arms fire was also reported at Starohnativka. No ceasefire violations were registered in Luhansk region. According to the information published by the ATO HQ on their Facebook page in the morning, pro-Russian troops had opened fire on 47 occasions on Ukrainian positions on 8 August, including on 20 occasions in the region of Mariupol, on 16 occasions in the areas surrounding Donetsk city, and on 11 occasions in Luhansk region. The fire was returned on several occasions. The spokesman of the Presidential Administration on issues related to ATO reported at noon that one Ukrainian serviceman was killed and five others were wounded in action in the Donbass region over the past 24 hours. The casualties occurred in the region of Mariupol. Donetsk People's Republic deputy minister of defence, Eduard Basurin, reported that the Ukrainian military opened fire on pro-Russian positions on 567 occasions using small arms, rocket launchers, 82 mm and 120 mm mortars, armoured fighting vehicles, 122 mm and 152 mm self-propelled artillery. Ukrainian forces attacked Yasynuvata, Spartak, Mineralne, Vasiiivka, Zhabicheve, Oleksandrivka, Staromykhailivka, Styla, Dokuchaievsk, Panteleymonivka, Krutaya Balka, Kominternovo, Sakhanka and Petrovsky district in Donetsk city. Sources from the Luhansk People's Republic recorded eight Ukrainian violations of the truce inside the boundaries of the self-styled republic. The Ukrainian military opened fire with small arms, automatic grenade launchers, 73 mm recoilless antitank guns, 82 mm and 120 mm mortars on the villages of Lohvynove, Kalynivka, Stakhanov, Kalinove and Lozove. The press-centre of the ATO HQ reported in the evening that by 6:00 pm pro-Russian troops had opened fire on Ukrainian positions on 20 occasions, half of that occurred in the region of Mariupol, where pro-Russian armoured vehicles attacked Ukrainian redoubts at Shyrokyne, which also came under 82 mm and 120 mm mortar fire. Mortar volleys also landed in Novtroitske, while Hnutove was the target of rocket launchers. Around Donetsk city, 122 mm self-porpelled artillery pounded the strongholds of Avdiivka and Verkhnyotoretske, and Krasnohorivka was shelled from 82 mm and 120 mm mortars. Ukrainian troops were harassed with machine gun fire at nearby Marinka. In the area of Horlivka, 122 mm artillery rounds landed in Zaitseve. In the northern section of the demarcation line, rebel forces shelled Novooleksandrivka with 82 mm and 120 mm mortars, while Ukrainian troops at Popasna were harassed with small arms fire. 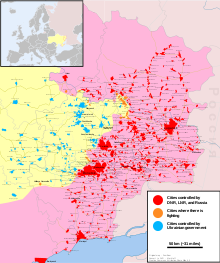 According to some observers "fighting between Ukrainian government forces and Russia-backed separatists has escalated to levels not seen since more furious phases of the conflict in the Donbas — where the separatists hold parts of the Donetsk and Luhansk regions — in 2014 and 2015. Casualties, both civilian and military, are mounting." More than 50 wounded Ukrainian servicemen were hospitalised in Kharkiv military hospital during the last week. The press-centre of the ATO HQ reported in the morning that pro-Russian troops had opened fire on 62 occasions on Ukrainian positions on 9 August. Rebel troops used banned heavy weapons such as antiaircraft cannons, armoured fighting vehicles, 82 mm mortars, 120 mm mortars and 122 self-propelled artillery. At noon it was reported that five Ukrainian servicemen were wounded in action in the Donbass region the previous day. Pro-Russian authorities denounced that Ukrainian forces opened fire 711 on their positions using small arms, grenade launchers, 82 mm mortars, 120 mm mortars, armoured fighting vehicles, 122 mm and 152 mm self-propelled guns. The Ukrainian military attacked pro-Russian redoubts at Zaitseve, Yasynuvata, Spartak, Ozeryanivka, Krasny Partizan, Holmivskiy, Vasiilivka, Yasne, Staromyhailivka, Dokuchaievsk, Kominternove, Leninske, Sakhanka and Petrovsky district in Donetsk city. There were five violations of the ceasefire by Ukrainian troops inside the boundaries of the self-proclaimed Luhansk People's Republic, according to the same sources. Ukrainian armoured fighting vehicles from Svetlodarsk attacked pro-Russian positions at Lozove, while Kalinove came under 82 mm mortar fire. the Ukrainian military shelled Lohvynove with automatic grenade launchers and recoilless antitank guns from Luhanske. Two civilian residents of Donetsk city were killed by heavy shelling. The deaths were confirmed by members of the OSCE mission on 11 August. According to the information published by the ATO HQ on their Facebook page in the evening, pro-Russian troops had opened fire on Ukrainian positions on 22 occasions throughout the day. Most incidents took place around Mariupol, where the village of Vodiane came under 122 mm self-propelled artillery fire. Mortar rounds landed in nearby Talakivka, and rocket propelled grenades in Hnutove. The separatists opened fire with antiaircraft artillery on Ukrainian redoubts at Novotroitske. In the surroundings of Donetsk city, Avdiivka was the target of heavy machine guns, rocket launchers, 82 mm and 120 mm mortars. Nevelske was hit by 82 mm mortar volleys. In the region of Horlivka, Ukrainian forces at Novoselivka were fired at from grenade launchers. In the northern front, in Luhansk Oblast, The rebels fired heavy machine guns and rocket launchers at Novozvanivka, Novooleksandrivka and Zolote. Two children were injured in a shelling of Marinka at around 07:30 pm. According to the information provided by the ATO HQ in the morning, pro-Russian troops had opened fire on 67 occasions on Ukrainian positions on 10 August. The State Border Service reported that their checkpoint "Stanitsa Luhanska" and control post "Mariinka" were fired at after 09:00 pm. The spokesman of the Presidential Administration on issues related to ATO, Oleksandr Motuzyanyk, reported at noon that one Ukrainian serviceman was killed and four others were wounded in action in the Donbass region the previous day. Pro-Russian officials reported that Ukrainian forces opened fire on their positions on 267 occasions using small arms, rocket launchers, 82 mm mortars, 120 mm mortars, armoured fighting vehicles, 122 mm and 152 mm self-propelled artillery. The Ukrainian military attacked Zaitseve, Spartak, Olenivka, Styla, Dokuchaievsk, Mineralne, Vesele, Yasynuvata, Leninske, Sakhanka, Kominternove and Petrovsky district. According to Luhansk People's Republic authorities, the Ukrainian military broke the ceasefire on four occasions inside its boundaries over the past 24 hours. Ukrainian tanks from Stanitsya Luhanska, supported by 82 mm mortar fire, attacked pro-Russian redoubts around Knyaz Igor memorial. Meanwhile, Slavyanoserbsk was the target of 82 mm mortar barrages fired from Krymske. Nyzhne Lozove was shelled from Ukrainian positions at Luhanske with automatic grenade launchers and 73 mm recoilless antitank guns. According to the information published by the ATO HQ on their Facebook page in the evening, pro-Russian troops had opened fire on Ukrainian positions on 13 occasions throughout the day, including on seven occasions in the region of Mariupol and on six occasions in the region of Donetsk city. Pro-Russian armoured fighting vehicles shelled Ukrainian redoubts at Shyrokyne, which earlier had become the target of 82 mm mortars. Rocket propelled grenades landed around Ukrainian forces at Novoaleksandrivka, while Taramchuk and Talakivka came under small arms, rocket launcher and 82 mm mortar fire. Small arms fire was reported at Starohnativka. In the outskirts of Donetsk city, the separatists fired heavy machine guns and grenade launchers at Ukrainian positions in Avdiivka. Ukrainian troops at Verkhnyotoretske were harassed with sniper fire. North of Horlivka, Zaitseve was the target of heavy machine gun fire and rocket propelled grenades. The Kremlin announced on its website that Russia was considering tightening security at the land and sea borders with Ukraine, following the alleged incidents in Crimea. A three-day anti-sabotage drills to counter potential underwater attacks on Black Sea naval installations was announced. President Putin mentioned that "... two our servicemen were killed. Undoubtedly, we shall not overlook this kind of affairs". According to the article, published by the Russia Today, one FSB serviceman died as a result of shelling from Ukrainian side. No geographical location of the borders between two nations were specified. Upon request of the Ukraine mission to the United Nations the meeting of the United Nations Security Council will discuss growing tensions between Ukraine and Russia on Thursday, 11 August, in a closed door meeting. The press-centre of the ATO HQ reported in the morning that pro-Russian troops had opened fire on 42 occasions on Ukrainian positions on 11 August, including on 21 occasions in the region of Mariupol. The spokesman of the Presidential Administration on issues related to ATO, Oleksandr Motuzyanyk, reported at noon that one Ukrainian serviceman was killed and four others were wounded in action in the Donbass region the previous day. One Ukrainian serviceman was lethally wounded in Popasna on 12 August at around 00:00 am, two Ukrainian servicemen were wounded. According to pro-Russian officials, one of their soldiers died and other three were wounded in battle over the past week. Three civilians were killed and seven injured on the same period. According to Luhansk People's Republic sources, there were six violations of the ceasefire by the Ukrainian army. Ukrainian armoured fighting vehicles from Luhanske attacked pro-Russian redoubts at Kalynivka and Lozove supported by automatic grenade launchers, 73 mm recoilless antitank guns and 120 mm mortars. Sokolniki and Knyaz Igor memorial came under 82 mm mortar fire. According to the information published by the ATO HQ on their Facebook page in the evening, pro-Russian troops had opened fire on Ukrainian positions on 19 occasions throughout the day. In the region of Mariupol, pro-Russian armoured fighting vehicles shelled Novohryhorivka, while Ukrainian troops at Shyrokyne came under sniper fire. The rebels also attacked Vodiane, Shyrokyne and Novohryhorivka with small arms, heavy machine guns and grenade launchers. Around Donetsk city, 82 mm mortar volleys landed in Krasnohrivka and Nevelske, while heavy machine gun fire was reported at Avdiivka. Heavy machine guns were also used to harass Ukrainian forces at Zaitseve, north of Horlivka. In the northern sector of the demarcation line, Novooleksandrivka was hit by 120 mm mortar rounds and heavy artillery fire. The rebels also fired heavy machine guns and rocket launchers at Ukrainian outposts near Novozvanivka just before dawn. According to the information provided by the ATO HQ in the morning, pro-Russian troops had opened fire on 61 occasions on Ukrainian positions on 12 August, including on 31 occasions in the region of Mariupol, on 16 occasions near Donetsk city, and on 14 occasions in Luhansk region. At noon it was reported that one Ukrainian serviceman was killed and two others were wounded in action in the Donbass region the previous day. Two clashes between the warring parties took place in the region of Mariupol during the first hours of 13 August, one at Nikolaevka and the other near Bohdanivka. Separatist authorities said that the Ukrainian military fired upon their troops on 289 occasions. The Ukrainian forces employed small arms, rocket launchers, 82 mm mortars, 120 mm mortars, armoured fighting vehicles, 122 mm and 152 mm self-propelled artillery. The main targets were Zaitseve, Vasiliivka, Horlivka, Mineralne, Yasynuvata, Staromykhailivka, Oleksandrivka, Dokuchaievsk, Styla, Leninske, Sakhanka and Petrovsky district. Sources from the Luhansk People's Republic reported that Ukrainian forces broke the truce inside the boundaries of the republic on five occasions. Ukrainian armoured fighting vehicles from Stanitsya Luhanska shelled pro-Russian positions around Knyaz Igor memorial, while Lozove was fired at from automatic grenade launchers. Separatist troops at Zhovte were harassed with small arms fire. Authorities from the republic also denounced a total of 45 Ukrainian violations of the ceasefire over the past week. According to the information published by the ATO HQ on their Facebook page in the evening, pro-Russian troops had opened fire on Ukrainian positions on 22 occasions throughout the day, including on 11 occasions in the region of Mariupol, where heavy shelling was reported at Sladke, Lebedynske, Talakivka, Nikolaevka, Bohdanivka and Starohnativka. In the surroundings of Donetsk city, pro-Russian forces struck Maryinka with heavy artillery, and poured mortar fire on Avdiivka and Novoselivka. Ukrainian redoubts at Novhorodske and Troitske were fired at from heavy machine guns and rocket launchers. In the northern front, Novotroitske and Zhovte were the target of rocket propelled grenades and mortar barrages. The ATO HQ reported in the morning that pro-Russian troops had opened fire on Ukrainian positions on 56 occasions the previous day, including on 27 occasions in the region of Mariupol, on 23 occasions in the surroundings of Donetsk city, and on 6 occasions in Luhansk region. Ukrainian military sources claimed that the separatists fired Russian-designed RPG-27 antitank rockets on a pedestrian bridge near Stanitsya Luhanska. The rocket is not in the inventories of Ukrainian government forces. Three Ukrainian servicemen were wounded in action in the Donbass region on 13 August. Donetsk People's Republic defence deputy minister, Eduard Basurin, denounced that the Ukrainian military opened fire on their positions on 675 occasions. The Ukrainian army used small arms, rocket launchers, 82 mm mortars, 120 mm mortars, armoured fighting vehicles, tanks, 122 mm and 152 mm self-propelled guns. The incidents took place at Zaitseve, Horlivka, Shyroka Balka, Krutaya Balka, Yasynuvata, Spartak, Yasne, Olenivka, Aleksandrivka, Dokuchaievsk, Oktyabr, Kominternove, Leninske, Sakhanka and Petrovsky district. According to separatist sources, Ukrainian troops broke the ceasefire on ten occasions inside the territory of the Luhansk People's Republic. Ukrainian armoured fighting vehicles from Luhanske attacked pro-Russian positions at Kalynivka, which also became the target of automatic grenade launchers, and 82 mm mortars. Lohvynove and Kalinove were shelled from 120 mm mortars. Kalinove was also struck by 73 mm grenades from recoilless antitank guns. Separatist troops at Zhovte were attacked with small arms and 82 mm mortars from Popasna. Ukrainian forces from Troitske fired at Vesela Hora with 73 mm recoillles antitank guns and 82 mm mortars. According to the information published by the ATO HQ in the evening, pro-Russian troops had opened fire on Ukrainian positions on 28 occasions throughout the day. In the area of Donetsk city, 82 mm and 120 mm mortar volleys landed in Avdiivka, while Maryinka came under heavy machine gun and 120 mm mortar fire. Sniper fire was reported at Verkhnyotoretske, and Ukrainian troops at Krasnohorivka werthe target of small arms. In the region of Mariupol, rocket propelled grenades landed in Shyrokyne and Hnutove. Ukrainian redoubts at Talakivka were the target of heavy machine gun fire and 120 mm mortar volleys. In the northern front, Novooleksandrivka was fired at from heavy machine guns and 82 mm mortars. Novozvanivka and Krymske were hit by rocket propelled grenades. According to the information provided by the ATO HQ on their Facebook page in the morning, pro-Russian troops had opened fire on 64 occasions on Ukrainian positions on 14 August, including on 28 occasions in the region of Mariupol, on 23 occasions near Donetsk city, and on 8 occasions in Luhansk region. A clash between the warring parties took place in the region of Novoaleksandrivka, Luhansk Oblast. One Ukrainian serviceman was wounded in action in the Donbass region the previous day. Separatist sources said that Ukrainian troops opened fire on 675 occasions on Ukrainian positions using small arms, rocket launchers, 82 mm mortars, 120 mm mortars, armoured fighting vehicles, and 152 mm self-propelled guns. The Ukrainian army targeted rebel redoubts at Zaitseve, Krutaya Balka, Shyroka Balka, Yasynuvata, Spartak, Dokuchaievsk, Kominternove, Leninske,Sakhanka, Oktyabr and the surroundings of Donetsk city. Luhansk rebels have confirmed the death of two militiamen near Kalinove, after their position was hit by 120 mm mortar volleys fired from Novooleksandrivka, in the course of a Ukrainian assault. The attack also involved the use of small arms and automatic grenade launchers. Separatist sources claimed that the bodies of the dead soldiers were recovered by Ukrainian troops. According to the information published by the ATO HQ on their Facebook page in the evening, separatist troops had opened fire on Ukrainian positions on 18 occasions throughout the day. In the region of Mariupol, Novoselivka was shelled by 122 mm self-propelled artillery, while Vodiane and Taramchuk came under 82 mm and 120 mm mortar fire. Ukrainian troops at Shyrokyne were harassed with small arms fire, and Ukrainian forces at Bohdanivka clashed with pro-Russian scouts. Avdiivka, west of Donetsk city, became the target of pro-Russian mortars. Mortar barrages and rocket propelled grenades also landed in Maiorsk, west of Horlivka. In the same area, Ukrainian troops at Zaitseve and Nyzhne Lozove received small arms fire. In the northern section of the demarcation line, Novooleksandrivka, Zhovte and Novotroitske were fired at from rocket launchers. Sniper fire was also reported at Novotroitske. Two Ukrainian servicemen were wounded during the shelling of the industrial area of Avdiivka. The ATO HQ reported in the morning that pro-Russian troops had opened fire on 48 occasions on Ukrainian positions the previous day, including on 23 occasions in the region of Mariupol. The State Border Service reported that their control post "Maiorsk" was fired at from mortars at 11:00 pm. The spokesman of the Presidential Administration on issues related to ATO, Oleksandr Motuzyanyk, reported at noon that eight Ukrainian servicemen were wounded in action in the Donbass region on 15 August. Pro-Russian officials reported that Ukrainian forces opened fire 578 times upon their positions. The Ukrainian military employed used small arms, rocket launchers, 82 mm mortars, 120 mm mortars, armoured fighting vehicles, tanks, 122 mm and 152 mm self-propelled guns. The main targets were Zaitseve, Mikhaylivka, Shyroka Balka, Yasynuvata, Vesele, Mineralne, Vasiliivka, Dokuchaievsk, Kominternove, Sakhanka, Belaya Kamyanka and the outskirts of Donetsk city. Authorities from the self-styled Luhansk People's Republic said that the Ukrainian army broke the ceasefire on five occasions inside the republic boundaries. Ukrainian tanks from Stanitsya Luhanska attacked pro-Russian entrenchments around Knyaz Igor memorial, while Kalynivka was shelled by rocket launchers and 73 mm recoilless antitank guns from Luhanske. The village of Katerinove came under 82 mm mortar fire. According to the information published by the ATO HQ on their Facebook page in the evening, pro-Russian troops had opened fire on Ukrainian positions on 20 occasions throughout the day. In the region of Mariupol, 152 mm artillery volleys landed in Rybinske, while nearby Novoselivka was the target of 122 mm artillery fire. The rebels poured 120 mm mortar rounds on Lebedynske and Slavne. Chermalyk was meanwhile pounded by 82 mm mortar volleys. A volunteer from Berdiansk was killed during the shelling of Chermalyk at around 02:00 am. Around Donetsk city, Avdiivka came once again under rocket and mortar fire, while 82 mm mortar rounds struck Verkhnyotoretske. Ukrainian troops at Luhanske, north of Horlivka, received heavy machine gun fire. In the northern front, the rebels fired 122 mm self-propelled guns at Vrubovke. Sniper activity was reported at Novooleksandrivka. The ATO HQ reported in the morning that pro-Russian troops had opened fire on 52 occasions on Ukrainian positions on 16 August, including on 23 occasions near Donetsk city, on 20 occasions in the region of Mariupol, and on 9 occasions in Luhansk Oblast. Eight Ukrainian servicemen were wounded in action in the Donbass region the previous day. According to separatist officials, Ukrainian forces opened fire on their positions on 698 occasions. The Ukrainian military opened fire with small arms, grenade launchers, 120 mm mortars, armoured fighting vehicles, 122 mm and 152 mm self-propelled artillery and "Grad" multiple rocket launchers. The main targets were Zaitseve, Yasynuvata, Spartak, Vasiliivka, Vesele, Dokuchaievsk, Belaya Kamyanka, Hryhorivka, Novolaspa, Novomaiivka, Nikolaevka, Sosnovske, Kominternove, Leninske, Sakhanka, Oleksandrivka and Petrovsky district. Sources from Luhansk People's Republic reported four Ukrainian violations of the truce in the territory of the self-proclaimed state. Ukrainian armoured fighting vehicles from Stanitsya Luhanska shelled pro-Russian redoubts around Knyaz Igor memorial, which also became the target of 82 mm mortars. Rebel troops at Kalinove were harassed with small arms fire from Popasna, while 82 mm mortar volleys fired from Luhanske landed in Kalynivka. According to the information published by the ATO HQ on their Facebook page in the evening, separatist troops had opened fire on Ukrainian positions on 45 occasions throughout the day. In the region of Mariupol, 152 mm artillery barrages landed in Sionitne, while pro-Russian armoured fighting vehicles attacked Ukrainian redoubts at Shyrokyne. Ukrainian troops at Talakivka and Vodiane came under mortar fire, and the strongholds of Chermalyk and Novohnativka were hit by rocket propelled grenades. Around Donetsk city, the rebels fired 122 mm self-propelled artillery at Pisky and Maryinka, which also was the target of sniper and mortar fire. Mortar volleys also struck Avdiivka, Kamyanka and Krasnohorivka, while Pisky received a combination of mortar and 122 mm artillery fire. In the area of Horlivka, separatist forces shelled Semihirya, Novoselivka, Luhanske, Zaitseve and Novhorodske. In the northern section of the demarcation line, 122 mm artillery rounds landed in Popasna and Novooleksandrivka, where mortar and antitank rocket fire was also reported. Zolote, Stanitsya Luhanska and Krymske were shelled from rocket launchers and mortars. Two Ukrainian servicemen were killed and four others wounded due to shelling in the industrial area of Avdiivka. According to the information provided by the ATO HQ on their Facebook page in the morning, pro-Russian troops had opened fire on 96 occasions on Ukrainian positions on 17 August, including on 45 occasions in the surroundings of Donetsk city and on 32 occasions in the region of Mariupol. The spokesman of the Presidential Administration on issues related to ATO, Oleksandr Motuzyanyk, reported at noon that three Ukrainian servicemen were killed and six wounded in action in the Donbass region the previous day. According to Donetsk People's Republic deputy minister of defence, Eduard Basurin, Ukrainian forces opened fire on pro-Russian positions on 428 occasions with small arms, rocket launchers, 120 mm mortars, 122 mm and 152 mm self-propelled artillery. The main incidents occurred at Zaitseve, Horlivka, Yasynuvata, Dokuchaievsk and Petrovsky district. Authorities from the self-styled Luhansk People's Republic said that Ukrainian forces committed five ceasefire violations inside the territory of the republic. Ukrainian tanks shelled pro-Russian redoubts around Knyaz Igor memorial and the village of Pervomaisk, while armoured fighting vehicles, supported by automatic grenade launchers, attacked Kalynivka. Heavy shelling from 152 mm self-propelled artillery was reported in the town of Stakhanov. According to the information published by the ATO HQ on their Facebook page in the evening, separatist troops had opened fire on Ukrainian positions on 37 occasions throughout the day. Pro-Russian tanks shelled Ukrainian redoubts at Troitske, in the surroundings of Donetsk city, while nearby Verkhnyotoretske was attacked by armoured fighting vehicles. Rebel forces opened fire on Ukrainian troops around Avdiivka with small arms, heavy machine guns, grenade launchers and mortars. Troitske was also pounded by 152 mm self-propelled artillery. Rocket propelled grenades and mortar rounds hit Maryinka and Krasnohorivka. In the region of Horlivka, 152 mm self-propelled guns were fired at Ukrainian entrenchments at Semihirya, while 122 mm artillery volleys struck Luhanske and Leninske. Pro-Russian armoured fighting vehicles shelled meanwhile Novhorodske and Novoselivka. Around Mariupol, Ukrainian positions at Mirne endured heavy shelling from 122 mm self-propelled artillery. Mortar rounds and rocket propelled grenades landed in Pavlopil, and Ukrainian troops at Novohryhorivka were harassed with small arms fire. Clashes between the warring factions involving small arms and 73 mm recoilless antitank guns were reported at Bohdanivka. In the northern front, Novozvanivka and Popasna were shelled from 122 mm self-propelled guns, and Zolote became the target of automatic grenade launchers and 120 mm mortars. Novooleksandrivka and Novotroitske were struck by rocket propelled grenades. The ATO HQ reported in the morning, that pro-Russian troops had opened fire on 73 occasions on Ukrainian positions on 18 August, including on 38 occasions near Donetsk city and on 23 occasions in the region of Mariupol. The spokesman of the Presidential Administration on issues related to ATO, Oleksandr Motuzyanyk, reported at noon that two Ukrainian servicemen were killed and eight wounded in action in the Donbass region the previous day. All the casualties occurred in the region of Donetsk city. Sources from the self-proclaimed Luhansk People's Republic said that there were nine Ukrainian violations of the truce inside their boundaries over the past 24 hours. Ukrainian forces from Popasna shelled Kalinove with automatic grenade launchers, 73 mm recoilless antitank guns, 82 mm and 120 mm mortars. Pervomaisk became the target of automatic grenade launchers, 82 mm mortars and 120 mm mortars also fired from Popasna by Ukrainian troops. Rocket propelled grenades and 82 mm and 120 mm mortar rounds landed around pro-Russian positions in Knyaz Igor memorial, south of Stanitsya Luhanska, while pro-Russian troops at Sokolniki were pounded with small arms, rocket launchers and automatic grenade launchers firing from nearby Krymske. According to the information published by the ATO HQ in the evening, pro-Russian troops had opened fire on Ukrainian positions on 21 occasions throughout the day, mainly in the area surrounding Donetsk city and Horlivka. The settlements of Krasny Pakhar and Zaitseve, north of Horlivka, received heavy shelling from 122 mm self-propelled artillery. Zaitseve along with Luhanske and Maiorsk, also came under heavy machine gun, rocket propelled grenade and mortar fire. Pro-Russian armoured fighting vehicles shelled Luhanske. West of Donetsk city, 82 mm mortar rounds landed in Pisky and Maryinka, while Ukrainian outposts near Avdiivka were raked by heavy machine gun fire. In the region of Mariupol, pro-Russian armoured fighting vehicles attacked Ukrainian redoubts near Starohnativka. The coastal village of Shyrokyne was fired at from rocket launchers, while Ukrainian troops at Vodiane were harassed with small arms fire. In the northern section of the demarcation line, 82 mm mortar volleys landed around Ukrainian defences near Stanitsya Luhanska. Zhovte, meanwhile, was attacked with rocket propelled grenades, and Ukrainian troops at Popasna received small arms fire. According to the information provided by the ATO HQ on their Facebook page in the morning, pro-Russian troops had opened fire on 49 occasions on Ukrainian positions the previous day, including on 27 occasions in the surroundings of Donetsk city and on 17 occasions in the region of Mariupol. The spokesman of the Presidential Administration on issues related to ATO reported at noon that one Ukrainian serviceman was killed and four others were wounded in action in the Donbass region on 19 August. Pro-Russian authorities reported that the Ukrainian military opened fire on 480 occasions over their troops. The Ukrainian army employed small arms, grenade launchers, 82mm mortars, 120mm mortars, armoured fighting vehicles, 122mm and 152mm self-propelled artillery to target Zaitseve, Vasiliivka, Horlivka, Yasynuvata, Vesele, Spartak, Olenivka, Styla, Dokuchaievsk, Belaya Kamyanka, Petrovske, Novolaspa, Kominternove and Sakhanka. According to officials from the self-proclaimed Luhansk People's Republic, Ukrainian forces broke the ceasefire on seven occasions inside the republic boundaries. Ukrainian armoured fighting vehicles from Luhanske attacked pro-Russian positions at Lozove. Recoilless antitank guns were fired at Slavyanoserbsk and the surroundings of Zolote, while Lohvynove was shelled from Luhanske and Mironovske with 82mm and 120mm mortar volleys. Kalinove was also the target of 120mm mortars firing from Popasna and Novooleksandrivka. The ATO HQ reported in the evening that as of 6:00 pm pro-Russian troops had opened fire on Ukrainian positions on 26 occasions throughout the day. The rebels carried out 11 attacks on Ukrainian redoubts at Avdiivka, west of Donetsk city, and in the area around Horlivka. The separatist used small arms, 82mm mortars and 120mm mortars. In the region of Mariupol, Starohnativka and Novohryhorivka came under 120mm mortar fire, while 82mm mortar volleys landed in Shyrokyne. Novohryhorivka was also the target of heavy machine gun fire and sniper fire was reported at Shyrokyne. Ukrainian troops at Vodiane, Taramchuk and Shyrokyne were harassed with small arms fire. In the northern sector of the demarcation line, Ukrainian forces at Novozvanivka became the target of rocket propelled grenades and mortar rounds. Automatic grenade launchers were fired at the Ukrainian stronghold of Krymske while hostile snipers were active at Novooleksandrivka. The ATO HQ reported in the morning on their Facebook page, that pro-Russian troops had opened fire on 71 occasions on Ukrainian positions on 20 August, including on 38 occasions in the region of Mariupol and on 26 occasions near Donetsk city. The spokesman of the Presidential Administration on issues related to ATO, Oleksandr Motuzyanyk, reported at noon that two Ukrainian servicemen were wounded in action in the Donbass region the previous day. Ukrainian forces opened fire 527 times on pro-Russian positions on the same period, this according to Eduard Basurin, deputy defence minister of the Donetsk People's Republic. The Ukrainian military used small arms, grenade launchers, 82mm mortars, 120mm mortars, armoured fighting vehicles, 122mm and 152mm self-propelled artillery. The main incidents took place at Zaitseve, Holmivskiy, Vasiliivka, Horlivka, Krasny Partizan, Yasynuvata, Spartak, Staromykhailivka, Oleksandrivka, Olenivka, Dokuchaievsk, Hryhorivka, Kominternove and Sakhanka. Two civilian residents were killed by shelling, one in Yasynuvata and another in Kominternove. One pro-Russian soldier was also killed in action. Authorities from the self-styled Luhansk People's Republic reported four Ukrainian violations of the ceasefire within the republic boundaries. The main target was the village of Troitske, shelled from 152mm self-propelled artillery. Pro-Russian troops at Pervomaisk were pounded with small arms fire, automatic grenade launchers and 73mm recoilless antitank guns firing from Popasna and Luhanske. Lohvynove also came under recoilless antitank gun fire. According to the information published by the ATO HQ in the evening, pro-Russian troops had opened fire on Ukrainian positions on 23 occasions throughout the day. Pro-Russian armoured fighting vehicles attacked Ukrainian redoubts at Krasnohorivka, which also came under 82mm mortar fire. Also in the area around Donetsk city the rebels fired rocket launchers and 82mm mortars at Avdiivka, Troitske and Verkhnyotoretske, where Ukrainian troops became the target of sniper fire. North of Horlivka, the Ukrainian strongholds of Novoselivka and Luhanske were pounded with heavy machine gun fire, grenade launchers and 82mm and 120mm mortars. In the region of Mariupol, heavy shelling was reported at Novotroitske, which became the target of 120mm mortar and 122 self-propelled artillery barrages. The separatists attacked Shyrokyne with heavy machine guns, 82mm mortars and 120mm mortars. Ukrainian troops at Hranitne were harassed with heavy machine gun fire. In the northern section of the demarcation line, pro-Russian forces opened fire on Novooleksandrivka with heavy machine guns, grenade launchers and 82mm mortars. On the Hromadske website, the news agency reported at 10 AM local time that Russian forces shelled the Maryinka Checkpoint, west of the city of Petrovka. And, in a statement by the State Border Guard Service of Ukraine, reportedly pro-Russian forces used grenades and machine guns during the attack. According to the information provided by the ATO HQ on their Facebook page in the morning, pro-Russian troops had opened fire on 46 occasions on Ukrainian positions the previous day, including on 21 occasions in the surroundings of Donetsk city, on 15 occasions in the region of Mariupol, and on 10 occasions in Luhansk region. The spokesman of the Presidential Administration on issues related to ATO reported at noon that six Ukrainian servicemen were wounded in action in the Donbass region on 21 August. Pro-Russian officials said that Ukrainian forces opened fire 189 times on their positions employing small arms, rocket launchers, 82mm and 120mm mortars, armoured fighting vehicles, tanks and 122mm self-propelled artillery. The Ukrainian military fired at Horlivka, Yasynuvata, Vasiliivka, Dokuchaievsk, Kominternove, Sakhanka, Hryhorivka, Leninske and Petrovsky district. According to sources from the self-proclaimed Luhansk People's Republic, Ukrainian forces broke the truce on three occasions inside the republic's territory. Stankhanov was once again shelled from 152mm self-propelled artillery, while 82mm mortar volleys landed in Kalynivka. Pro-Russian entrenchments at Knyaz Igor memorial were fired at from automatic grenade launchers. The ATO HQ reported in the evening that as of 6:00 pm pro-Russian troops had opened fire on Ukrainian positions on 19 occasions. The rebels shelled Novobakhmutivka with 122mm self-propelled artillery and Krasnohorivka with 120mm mortars, while Avdiivka, Pisky and Novoselivka became the target of heavy machine guns, automatic grenade launchers and 82mm mortars. Sniper fire was also reported at Avdiivka. In the region of Mariupol, automatic grenade launchers and 82mm mortars were fired at Ukrainian redoubts near Shyrokyne. Hnutove and Vodiane were shelled from 73mm recoilless antitank guns, while Ukrainian troops at Hranitne were harassed with small arms fire. According to the information provided by the ATO HQ in the morning, pro-Russian troops had opened fire on 54 occasions on Ukrainian positions on 22 August, including on 22 occasions in the surroundings of Donetsk city, on 20 occasions in the region of Mariupol, and on 12 occasions in Luhansk region. Eight Ukrainian servicemen were wounded in action in the Donbass region the previous day. According to pro-Russian officials, their positions were fired at by Ukrainian forces on 290 occasions. The Ukrainian army employed small arms, rocket launchers, 82mm and 120mm mortars, armoured fighting vehicles and 122 self-propelled artillery. One rebel soldier was killed and two wounded. Ukrainian forces shelled Spartak, Yasynuvata, Vasiliivka, Oleksandrivka, Sakhanka, Kominternove, Bezimenne and Petrovsky district. Authorities from the self-styled Luhansk People's Republic recorded five Ukrainian violations of the ceasefire inside their boundaries. Pro-Russian positions at Knyaz Igor memorial were struck by 82mm and 120mm mortar volleys. Recoilles antitank guns shelled Smile, while 82mm mortar rounds fired from Luhanske landed in Lohvynove. According to the information published by the ATO HQ in the evening, pro-Russian troops had opened fire on Ukrainian positions on 20 occasions throughout the day. In the areas around Donetsk city and Horlivka, 120mm mortar volleys landed in Maryinka, while pro-Russian armoured fighting vehicles attacked Svetlodarsk, which also became the target of 82 mm mortars. The same kind of weapon was used to engage Ukrainian forces at Luhanske.The rebels pounded Ukrainian entrenchments near Verkhnyotoretske with small arms, heay machine guns, rocket launchers and 73mm recoilless antitank guns. In the region of Mariupol, Sionitne was fired at by 152mm self-propelled guns, while 122mm artillery rounds landed in Mirne. Vodiane came under 120mm mortar fire, and pro-Russian armoured fighting vehicles shelled Hnutove. Ukrainian troops were harassed with heavy machine gun fire at Shyrokyne and small arms fire at Starohnativka.Krymske, in the northern front, was shelled from automatic grenade launchers and 82mm mortars, Ukrainian troops at the nearby villages of Lopaskyne and Zolote received heavy machine gun and small arms fire. According to information provided by the ATO HQ, pro-Russian troops advanced into the city of Avdiivka Ukrainian forces responded which resulted in three pro-Russian servicemen killed, their 12.7mm machine gun being captured, and eight Ukrainian soldiers wounded. According to the information provided by the ATO HQ on their Facebook page in the morning, pro-Russian troops had opened fire on 48 occasions on Ukrainian positions the previous day, including on 19 occasions in the surroundings of Donetsk city, on 22 occasions in the region of Mariupol, and on 7 occasions in Luhansk region. The spokesman of the Presidential Administration on issues related to ATO reported at noon that one Ukrainian serviceman was killed and another wounded in action in the Donbass region on 23 August. Eduard Basurin, deputy defence minister of Donetsk People's Republic reported that Ukrainian forces opened fire on 250 occasions on pro-Russian positions. The Ukrainian military employed small arms, rocket launchers, 82mm and 120mm mortars, armoured fighting vehicles, 122mm and 152mm self-propelled artillery to pound the settlements of Zaitseve, Holmivskiy, Horlivka, Shyroka Balka, Krutaya Balka, Yasynuvata, Vasiliivka, Molidezhne, Aleksandrovka, Lyubivka, Oktyabr, Kominternove, Sakhanka, Leninske and Kirov district. According to authorities from Luhansk People's Republic, Ukrainian forces broke the ceasefire on seven occasion within the republic's territory. Vuhlehirsk was shelled from Troitske with 152mm self-propelled artillery, while 82mm mortar rounds landed in Sanzharivka. Kalinove, meanwhile, was bombarded with 122mm self-propelled artillery firing from Stepne and 82mm mortars from Novozvanivka and Lohvynove received 120mm mortar fire from Luhanske. Ukrainian forces fired automatic grenade launchers at Katerinove, while 82mm mortar volleys struck the village of Smile. The ATO HQ reported in the evening that as of 6:00 pm pro-Russian troops had opened fire on Ukrainian positions on 43 occasions. In the surroundings of Donetsk city and Horlivka, pro-Russian tanks shelled the stronghold of Avdiivka, which also became the target of 82mm and 120mm mortars Mortar barrages of the same caliber also hit the villages of Nevelske and Svetlodarsk. The rebels fired 122mm self-propelled artillery at Troitske and Luhanske, and 82mm mortar volleys landed in Maryinka and Krasnohorivka. In the region of Mariupol, heavy shelling was reported at Shyrokyne, which came under artillery and 120mm mortar fire. Novohryhorivka and Starohnativka were also shelled from 120mm mortars. Rocket propelled grenades landed in Vodiane, while Ukrainian soldiers at Novotroitske were the target of sniper fire. In the northern front, pro-Russian tanks attacked Ukrainian redoubts at Krymske, supported by 122mm self-propelled artillery. Ukrainian forces at Kalinove, Popasna, Novozvanivka, Zholobok and Novotoshkivka came meanwhile under 152mm artillery fire, The rebels fired small arms, sniper fire, heavy machine guns and rocket propelled grenades on Ukrainian outposts at Novooleksandrivka. Heavy machine gun fire was also reported at Zolote. One Ukrainian volunteer was killed by mortar fire in Zaitseve, north of Horlivka. According to the Ukrainian army the artillery fire of the separatist forces of the war in Donbass was the strongest since the February 2015 Battle of Debaltseve. According to the information provided by the ATO HQ in the morning, pro-Russian troops had opened fire on 85 occasions on Ukrainian positions on 24 August, including on 38 occasions in the surroundings of Donetsk city, on 22 occasions in the region of Mariupol, and on 25 occasions in Luhansk Oblast. The spokesman of the Presidential Administration on issues related to ATO, Andriy Lysenko, reported at noon that three Ukrainian servicemen were wounded in action in the Donbass region the previous day. Separatist authorities reported two civilian residents killed and eight wounded over the past 24 hours. The same sources said that the Ukrainian military opened fire on 695 occasions on pro-Russian positions using small arms, rocket launchers, 82mm and 120mm mortars, armoured fighting vehicles, tanks, 122mm and 152mm self-propelled artillery. The main targets were Zaitseve, Yasynuvata, Horlivka, Shyroka Balka, Kominternove, Sakhanka, Leninske, and Petrovsky district. Luhansk People's Republic officials recorded six Ukrainian violations of the ceasefire inside the republic's boundaries. Lohvynove became the target of 82mm and 120mm mortars and 122mm self-propelled artillery, while 82mm mortar volleys landed in Molodezhne. Pro-Russian redoubts at Knyaz Igor memorial were shelled from Stanitsya Luhanska with rocket launchers and 82mm mortars. According to the information published by the ATO HQ in the evening, pro-Russian troops had opened fire on Ukrainian positions on 21 occasions throughout the day. In the outskirts of Donetsk city, the rebels opened fire on Avdiivka with heavy machine guns, grenade launchers, mortars and 122 self-propelled artillery. Arkhanshelsk, 18 km northwest of Avdiivka, also came under 152mm artillery fire. Ukrainian troops at Maryinka were harassed with small arms, heavy machine guns and rocket propelled grenades. Pro-Russian armoured fighting vehicles attacked Ukrainian redoubts at Luhanske, in the area north of Horlivka. In the region of Mariupol, 120mm mortar volleys landed in Pavlopil and Novomyhailivka, and 82mm in Hnutove. Shyrokyne became the target of small arms, heavy machine guns and rocket launchers. In the northern section of the demarcation line, pro-Russian armoured fighting vehicles shelled Ukrainian positions at Stanitsya Luhanska. Automatic grenade launchers were fired on the village of Novooleksandrivka. According to the information provided by the ATO HQ on their Facebook page in the morning, pro-Russian troops had opened fire on 48 occasions on Ukrainian positions the previous day, including on 18 occasions in the surroundings of Donetsk city, on 21 occasions in the region of Mariupol, and on 9 occasions in Luhansk region; the fire was returned on several occasions. The spokesman of the Presidential Administration on issues related to ATO reported at noon that one Ukrainian serviceman was killed and two others were wounded in action in the Donbass region on 25 August. Pro-Russian sources reported five soldiers killed in action and five wounded over the past week. According to them, seven civilians were killed and 26 injured by Ukrainian shelling on the same period. According to Luhansk People's Republic officials, Ukrainian forces opened fire on pro-Russian positions inside the republic boundaries on four occasions. Knyaz Igor memorial was the target of automatic grenade launchers, while Lohvynove was fired at by 82mm mortars. Ukrainian troops from Novozvanivka also fired automatic grenade launchers at the rebel stronghold of Kalinove. The ATO HQ reported in the evening that as of 6:00 pm pro-Russian troops had opened fire on Ukrainian positions on 27 occasions. In the area around Donetsk city, Krasnohorivka came under 82mm and 120mm mortar fire. Mortar volleys also landed in Avdiivka and Pisky, while Ukrainian troops at Maryinka were harassed with small arms and sniper fire. In the region of Horlivka, the rebels fired rocket propelled grenades at Luhanske, and mortars at Zaitseve. Pro-Russian armoured fighting vehicles shelled Ukrainian positions at Svetlodarsk. In the surroundings of Mariupol, the separatists pounded Taramchuk, Lebedynske and Shyrokyne with 120mm mortars, Vodiane with 82mm mortars and Berezove with automatic grenade launchers. Small arms fire was reported at Shyrokyne. Heavy shelling was reported at Krymske, in the northern sector of the demarcation line, where Ukrainian outposts became the target of 122mm self-propelled artillery. Pro-Russian forces fired heavy machine guns near Zolote and small arms and rocket propelled grenades at Ukrainian troops in Novozvanivka. One Ukrainian volunteer was killed at Shyrokyne in the evening. Later in the evening, fighting broke out in the industrial area of Avdiivka. The contact group in Minsk proposed a renewed ceasefire agreement to be implemented on 1 September, in coincidence with the first day of the academic year. In Vuhledar (48 km south-west of Donetsk) a civilian had been stabbed fatally with a knife allegedly by a member of the Ukrainian Armed Forces Aidar battalion. The ATO HQ reported in the morning that pro-Russian troops had opened fire on 88 occasions on Ukrainian positions on 26 August, including on 37 occasions in the outskirts of Donetsk city and on 31 occasions in the region of Mariupol. The spokesman of the Presidential Administration on issues related to ATO reported at noon that four Ukrainian servicemen were wounded in action in the Donbass region the previous day. Eduard Basurin, deputy defence minister of defence of Donetsk People's Republic, reported that Ukrainian troops opened fire 710 times on pro-Russian positions employing small arms, grenade launchers, 82mm and 120mm mortars, armoured fighting vehicles, 122mm and 152mm self-propelled artillery. The main targets were Zaitseve, Yasynuvata, Spartak, Makiivka, Staromykhailivka, Oleksandrivka, Olenivka, Sakhanka, Leninske, Kuybishev and Petrovsky districts. According to officials from the self-styled Luhansk People's Republic, the Ukrainian military broke the ceasefire on eight occasions inside the republic's territory. Ukrainian armoured fighting vehicles attacked pro-Russian entrenchments at Sanzharivka, and the area of Knyaz Igor memorial was shelled from 82mm and 120mm mortars. Kalinove was the target of automatic grenade launchers firing from Novozvanivka, while 120mm mortar rounds landed in Sokolniki. Ukrainian forces from Luhanske shelled Kalynivka with recoilless antitank guns, and 82mm mortar fire was reported at Frunze. According to the information published by the ATO HQ in the evening, as of 6:00 pm pro-Russian troops had opened fire on Ukrainian positions on 14 occasions, mainly before 11:00 am. The rebels pounded the Ukrainian strongholds of Avdiivka and Pisky, in the outskirts of Donetsk city, with small arms and 120mm mortar fire. Nearby Pisky came under heavy artillery fire, and in the area of Horlivka, 120mm mortar rounds landed in Mironovske. In the region of Mariupol, Ukrainian troops at Novohryhorivka received heavy machine gun fire, and the defenders of Talakivka became the target of small arms fire. In the northern front, separatist forces attacked the Ukrainian garrison at Novooleksandrivka with small arms, automatic grenade launchers and 82mm mortars. According to the information provided by the ATO HQ on their Facebook page in the morning, pro-Russian troops had opened fire on 59 occasions on Ukrainian positions the previous day, including on 26 occasions in the surroundings of Donetsk city and on 24 occasions in the region of Mariupol. The spokesman of the Presidential Administration on issues related to ATO reported at noon that two Ukrainian servicemen were killed and four others wounded in action in the Donbass region on 27 August. Pro-Russian officials denounced that Ukrainian forces opened fire on 297 occasions on rebel positions using small arms, rocket launchers, 82mm and 120mm mortars, armoured fighting vehicles, 122mm and 152mm self-propelled artillery. The Ukrainian military attacked Zaitseve, Horlivka, Holmivskiy, Yasynuvata, Spartak, Mineralne, Sakhanka, Kominternove, Oleksandrivka, Kuybishev and Petrovsky district. Seven civilian residents were wounded. Authorities from the self-proclaimed Luhansk People's Republic reported ten Ukrainian violations of the ceasefire within the republic boundaries. Heavy shelling was reported at Lozove, which was pounded by 82mm mortars and 152mm self-propelled artillery, while 82mm and 120mm mortar volleys landed around rebel positions at Knyaz Igor memorial. Ukrainian armoured fighting vehicles from Novozvanivka, supported by 120mm mortar fire, attacked pro-Russian redoubts at Kalinove. Pervomaisk was also shelled by armoured fighting vehicles from Popasna. The ATO HQ reported in the evening that as of 6:00 pm pro-Russian troops had opened fire on Ukrainian positions on 27 occasions. Pro-Russian tanks in the area of Donetsk city attacked Ukrainian entrenchments at Avdiivka, which were also hit by 82mm and 120mm mortar barrages. Arkhanshelsk was once again rocked by the explosions of 152mm artillery rounds, and small arms fire was reported at Maryinka. Around Horlivka, armoured fighting vehicles racked Ukrainian redoubts at Svetlodarsk with cannon fire, while Maiorsk and Novoselivka were fired at from heavy machine guns and rocket launchers. Novoselivka was also struck by antitank guided missiles. East of Mariupol, 122mm artillery rounds hit the villages of Shyrokyne and Talakivka. Ukrainian troops at Vodiane and Novohryhorivka came under small arms and rocket propelled grenade fire. In the northern sector of the demarcation line, the rebels fired rocket launchers at Novozvanivka and Novooleksandrivka. Stanitsya Luhanska was the target of machine guns, rocket launchers and 82mm mortars. The ATO HQ reported in the morning that pro-Russian troops had opened fire on 76 occasions on Ukrainian positions on 28 August, including on 37 occasions in the outskirts of Donetsk city, on 27 occasions in the region of Mariupol, and on 12 occasions in Luhansk region. The spokesman of the Presidential Administration on issues related to ATO reported at noon that one Ukrainian serviceman was killed and nine others were wounded in action in the Donbass region the previous day. Pro-Russian officials claimed that Ukrainian forces fired upon their positions on 525 occasions using small arms, rocket launchers, 82mm and 120mm mortars, armoured fighting vehicles, tanks and 122mm self-propelled artillery. Horlivka, Ozeryanivka, Yasynuvata, Spartak, Mineralne, Vesele, Staromykhailivka, Olenivka, Oleksandrivka, Dokuchaievsk, Kominternove, Lenin, Sakhanka and Petrovsky district. Two rebel soldiers and four civilians were wounded. According to sources from the self-styled Luhansk People's Republic, the Ukrainian military committed seven violations of the ceasefire within the republic boundaries. Ukrainian armoured fighting vehicles from Luhanske attacked pro-Russian positions around Lohvynove and Kalynivka supported by automatic grenade launchers, 73mm recoilless antitank guns, 82mm and 120mm mortars and 152mm self-propelled artillery. Lobacheve, near Zhovte, was the target of automatic grenade launchers. According to the information published by the ATO HQ in the evening, as of 6:00 pm pro-Russian troops had opened fire on Ukrainian positions on 30 occasions. "Grad" multiple rocket launchers were fired at the Ukrainian stronghold of Krasnohorivka, west of Donetsk city, which was also hit by mortar barrages. The nearby villages of Nevelske and Keramik came under 152mm howitzer fire. Ukrainian troops at Verkhnyotoretske were attacked by pro-Russian armoured fighting vehicles and snipers. Avdiivka endured a 30-minute shelling from 122mm self-propelled artillery, and Ukrainian entrenchments in the area between Avdiivka and Luhanske, north of Horlivka, came under heavy machine gun, 82mm and 120mm mortar fire. Luhanske itself was shelled by antiaircraft guns and armoured fighting vehicles. In the region of Mariupol, the rebels fired heavy machine guns, rocket launchers and mortars at the coastal town of Shyrokyne. Mortar volleys also landed in Pavlopil, on the east bank of the Kalmius river, while Ukrainian troops at Talakivka received small arms fire. In the northern section of the demarcation line, Krymske, Novozvanivka and Novooleksandrivka came under rocket launcher fire. Ukrainian forces at Novozvanivka also became the target of hostile snipers. According to the information provided by the ATO HQ on their Facebook page in the morning, pro-Russian troops had opened fire on 91 occasions on Ukrainian positions the previous day, including on 46 occasions in the surroundings of Donetsk city, on 25 occasions in Luhansk region, and on 20 occasions in the region of Mariupol. The spokesman of the Presidential Administration of Ukraine on issues related to ATO, polkovnyk Andriy Lysenko, reported at noon that that one Ukrainian serviceman was killed, nine others were wounded, and two contused in action in the Donbass region on 29 August. Separatist sources said that Ukrainian troops opened fire on pro-Russian forces on 332 occasions with small arms, rocket launchers, 82mm and 120mm mortars, tanks, 122mm and 152mm self-propelled artillery. The Ukrainian military targeted Zaitseve, Yasynuvata, Spartak, Mineralne, Olenivka, Dokuchaievsk, Kominternove, Sosnovske, Sakhanka, Petrovsky and Kiev districts. Authorities from the self-proclaimed Luhansk People's Republic recorded 14 violations of the truce by Ukrainian forces within the republic boundaries. The Ukrainian army used automatic grenade launchers, 82mm mortars, 120mm mortars, 122mm and 152mm self-propelled artillery to shell the villages of Nyzhne Lozove, Lozove, Lohvynove, Zhovte, Kalynivka, Kalinove and Pervomaisk. The ATO HQ reported in the evening that as of 6:00 pm rebel troops had opened fire on Ukrainian positions on 33 occasions. Pro-Russian armoured fighting vehicles attacked Ukrainian redoubts at Luhanske, in the area around Horlivka. The village was also the target of heavy machine guns, rocket launchers and 82mm mortars. Novhorodske and Krasnohorivka were struck by 122mm artillery barrages, and small arms and rocket propelled grenade fire was reported at Maiorsk. In the outskirts of Donetsk city, 120mm mortar volleys landed in Verkhnyotoretske and Pisky. Pisky, along with Avdiivka, was also pounded with machine gun, rocket propelled grenade and 82mm mortar fire. Ukrainian troops at Marinka were harassed with small arms fire, sniper fire and rocket propelled grenades. East of Mariupol, 82mm mortar rounds landed in Shyrokyne. Meanwhile, in the northern section of the demarcation line Novooleksandrivka was fired at on three occasions with small arms, rocket launchers and mortars. The rebels poured heavy machine gun fire and rocket propelled grenades on Ukrainian troops at Novozvanivka. The ATO HQ reported in the morning that pro-Russian troops had opened fire on 75 occasions on Ukrainian positions on 30 August, including on 24 occasions in the outskirts of Donetsk city, on 24 occasions in the region of Mariupol, and on 26 occasions in Luhansk region. The spokesman of the Presidential Administration on issues related to ATO reported at noon that one Ukrainian serviceman was wounded in action in the Donbass region the previous day. On the previous night, a grenade launcher attack, followed by mortar fire, near an OSCE patrol base in Shchastya forced its occupants to withdraw. Pro-Russian sources reported that Ukrainian forces opened fire on their podpositions on 404 occasions over the past 24 hours. The Ukrainian military employed small arms, rocket launchers, 82mm and 120mm mortars, tanks, 122mm and 152mm self-propelled artillery to pound rebel positions at Zaitseve, Yasynuvata, Oleksandrivka, Olenivka, Dokuchaievsk, Kominternove, Leninske and Sakhanka. One civilian resident was killed and four wounded. Ukrainian forces broke the ceasefire on eight occasions in the territory of the self-proclaimed Luhansk People's Republic with small arms, automatic grenade launchers, 82mm mortars and 152mm self-propelled artillery. The main targets were pro-Russian positions at Vesela Hora, Kalinove, Kalinove-Borshchevate, Knyaz Igor memorial, Pervomaisk and Zhovte. According to the information published by the ATO HQ in the evening, as of 6:00 pm pro-Russian troops had opened fire on Ukrainian positions on 12 occasions. In the surroundings of Donetsk city, the separatists attacked Avdiivka with small arms, heavy machine guns and automatic grenade launchers, while Ukrainian troops at the nearby strongholds of Verkhnyotoretske and Maryinka were harassed with small arms fire. Small arms fire was also reported in the region of Mariupol, specifically in the villages of Bohdanivka, Shyrokyne, Novotroitske and Starohnativka. In the northern front, Ukrainian troops at Stanitsya Luhanska were engaged with automatic weapons. ^ "Map (3000×2894), The situation in the eastern regions of Ukraine, as of 1 August 2016 (00:00)". NSDC. 1 August 2016. Retrieved 1 August 2016. ^ "Сводные данные АТО – 1 августа" [Summary information on ATO as of 1 August] (in Russian). NSDC. 1 August 2016. Retrieved 1 August 2016. ...под Богдановкой силы АТО отбили нападение враждебной ДРГ. Бой длился около 20 минут и завершился для наших войск успешно. ^ "По две мины в минуту. Террористы совершили интенсивный обстрел украинских укреплений. ВИДЕО". sprotyv.info (in Russian and Ukrainian). Information Resistance. 2016-08-01. Retrieved 2016-08-01. ^ "ВСУ за сутки обстреляли прифронтовые территории ДНР более 850 раз – командование | ДАН". dan-news.info. Retrieved 2016-08-03. ^ "Под Авдеевкой, Опытным и Луганским идет активное противостояние" (in Russian). Liga News. 2016-08-01. Retrieved 2016-08-01. ^ a b "Сводные данные АТО – 03 августа" [Summary information on ATO as of 3 August] (in Russian). NSDC. 3 August 2016. Retrieved 3 August 2016. ^ "Оперативная сводка штаба АТО на 06:00 – 02 августа" [Operational summary of ATO HQ as of 2 August (06:00)] (in Russian). NSDC. 2 August 2016. Retrieved 2 August 2016. ^ "Оккупанты задействовали боевые машины пехоты в Широкино - штаб" (in Russian). Liga News. 2 August 2016. Retrieved 2 August 2016. ^ "Map (3000×2494), The situation in the eastern regions of Ukraine, as of 2 August 2016 (00:00)". NSDC. 2 August 2016. Retrieved 2 August 2016. ^ "Сводные данные АТО – 02 августа" [Summary information on ATO as of 2 August] (in Russian). NSDC. 2 August 2016. Retrieved 2 August 2016. На всем Донецком направлении по нашим позициям было выпущено более 260 мин – это рекордное количество за лето 2016 года. ^ "Украинские каратели 466 раз обстреляли ДНР, есть раненые среди мирного населения". News Front - новостной Фронт. 2016-08-02. Retrieved 2016-08-02. ^ "Украинские боевики восемь раз обстреляли позиции Народной милиции ЛНР". News Front - новостной Фронт. 2016-08-02. Retrieved 2016-08-03. ^ "Оперативная сводка штаба АТО на 06:00 – 03 августа" [Operational summary of ATO HQ as of 3 August (06:00)] (in Russian). NSDC. 2 August 2016. Retrieved 2 August 2016. ^ "Map (3000×2894), The situation in the eastern regions of Ukraine, as of 3 August 2016 (00:00)". NSDC. 3 August 2016. Retrieved 3 August 2016. ^ "Украинские силовики за сутки 872 раза нарушили режим тишины в ДНР". News Front - новостной Фронт. 2016-08-03. Retrieved 2016-08-03. ^ "Украинские силовики за сутки выпустили по территории Республики 67 мин, – Народная милиция". News Front - новостной Фронт. 2016-08-03. Retrieved 2016-08-03. ^ "Террористы обстреливают ВСУ на Донетчине, на Луганщине спокойно" (in Russian). Liga News. 2016-08-03. Retrieved 2016-08-03. ^ "Eastern Ukraine casualties highest since August 2015 – Zeid" (in English, Russian, and Ukrainian). OHCHR. 2016-08-03. Retrieved 2016-08-09. The many casualties we have documented in recent weeks suggest that neither Ukrainian forces nor the armed groups are taking the necessary precautions to protect civilians. In total, from mid-April 2014 to 31 July 2016, the UN Human Rights Office has documented 31,690 casualties, including 9,553 killed and 22,137 injured in the conflict area in eastern Ukraine. This includes Ukrainian armed forces, civilians and members of the armed groups. ^ "Оперативная сводка штаба АТО на 06:00 – 04 августа" [Operational summary of ATO HQ as of 4 August (06:00)] (in Russian). NSDC. 4 August 2016. Retrieved 4 August 2016. ^ "На юге фронта и в Авдеевке замечены снайперы оккупантов - штаб" (in Russian). Liga News. 4 August 2016. Retrieved 4 August 2016. ^ "Map (3000×2494), The situation in the eastern regions of Ukraine, as of 4 August 2016 (00:00)". NSDC. 4 August 2016. Retrieved 4 August 2016. ^ "Сводные данные АТО – 04 августа" [Summary information on ATO as of 4 August] (in Russian). NSDC. 4 August 2016. Retrieved 4 August 2016. ^ "На Донетчине семеро военных получили боевые ранения - штаб АТО" (in Russian). Liga News. 4 August 2016. Retrieved 4 August 2016. ^ "Басурин: ВСУ за сутки 466 раз обстреляли ДНР". News Front - новостной Фронт. 2016-08-04. Retrieved 2016-08-06. ^ "Пламя разгорается: в Донбассе возобновляются "полноценные" боевые действия". Retrieved 2016-08-06. ^ a b "В Опытном боевики применили противотанковый ракетный комплекс" (in Russian). Liga News. 4 August 2016. Retrieved 4 August 2016. ^ Vladimirov, Victor (4 August 2016). "Russian Troop Buildup Along Ukraine Border Raises War Fears". www.voanews.com. Moscow: VOA. Retrieved 5 August 2016. Russian Defense Minister Sergei Shoigu said in televised remarks last week that the military had created four new divisions, nine brigades and 22 regiments since 2013 and deployed them in the Southern Military District, adjacent to southern Ukraine, as well as in Russia's restive North Caucasus region. ^ "Оперативная сводка штаба АТО на 06:00 – 05 августа" [Operational summary of ATO HQ as of 5 August (06:00)] (in Russian). NSDC. 2 August 2016. Retrieved 2 August 2016. ^ "ДРГ врага обстреляла из гранатометов позицию ВСУ у Богдановки" (in Russian). Liga News. 2016-08-05. Retrieved 2016-08-05. ^ "Map (3000×2494), The situation in the eastern regions of Ukraine, as of 5 August 2016 (00:00)". NSDC. 5 August 2016. Retrieved 5 August 2016. ^ "Двое украинских военных ранены в зоне АТО за сутки, - Лысенко" (in Russian). 112 Ukraine. 2016-08-05. Retrieved 2016-08-05. ^ "Украинские фашисты за неделю более 3800 раз обстреляли ДНР". Retrieved 5 August 2016. ^ "ВСУ шесть раз обстреляли позиции Народной милиции ЛНР". News Front. Retrieved 5 August 2016. ^ "Оккупанты обстреливают ВСУ из минометов на Донетчине". news.liga.net (in Russian). Liga News. 2016-08-05. Retrieved 2016-08-05. ^ "Оперативная сводка штаба АТО на 06:00 – 06 августа" [Operational summary of ATO HQ as of 6 August (06:00)] (in Russian). NSDC. 6 August 2016. Retrieved 6 August 2016. ^ "Map (3000×2494), The situation in the eastern regions of Ukraine, as of 6 August 2016 (00:00)". NSDC. 6 August 2016. Retrieved 6 August 2016. ^ a b "Сводные данные АТО – 06 августа" [Summary information on ATO as of 6 August] (in Russian). NSDC. 6 August 2016. Retrieved 6 August 2016. ^ "Басурин: ВСУ за сутки около 450 раз нарушили "режим тишины"". News Front - новостной Фронт. 2016-08-06. Retrieved 2016-08-06. ^ "ВСУ за сутки три раза обстреляли позиции Народной милиции ЛНР". News Front - новостной Фронт. 2016-08-06. Retrieved 2016-08-06. ^ "Ukraine rebel leader injured in car blast". Gulf Today. 2016-08-06. Retrieved 2016-08-06. ^ "Plotnitsky's Car Blown Up in Occupied Luhansk". Ukrayinska Pravda. 2016-08-06. Retrieved 2016-08-06. ^ "ATO Staff: Ukraine Is Not Involved in Plotnitsky Assassination Attempt". Ukrayinska Pravda. 2016-08-06. Retrieved 2016-08-06. ^ "Ukraine Separatist Leader Injured In Attack". REF/RL. 6 August 2016. Retrieved 6 August 2016. ^ "В Марьинке во время столкновения украинские военнослужащие отбросили боевиков, - штаб АТО". 112.ua (in Russian). 112 Ukraine. 6 August 2016. Retrieved 6 August 2016. ^ "Оперативная сводка штаба АТО на 06:00 – 07 августа" [Operational summary of ATO HQ as of 7 August (06:00)] (in Russian). NSDC. 2 August 2016. Retrieved 2 August 2016. ^ "Боевики из 120-мм минометов обстреляли силы АТО в районе Авдеевки, - пресс-центр" (in Russian). Liga News. 2016-08-07. Retrieved 2016-08-07. ^ "Map (3000×2494), The situation in the eastern regions of Ukraine, as of 7 August 2016 (00:00)". NSDC. 7 August 2016. Retrieved 7 August 2016. ^ "Сводные данные АТО – 07 августа" [Summary information on ATO as of 7 August] (in Russian). NSDC. 7 August 2016. Retrieved 7 August 2016. ^ "ВСУ 309 РАЗ ОБСТРЕЛЯЛИ ДНР, ЕСТЬ РАНЕНЫЕ СРЕДИ МИРНЫХ ЖИТЕЛЕЙ". Retrieved 7 August 2016. ^ "ВСУ пять раз обстреляли позиции Народной милиции ЛНР". Retrieved 7 August 2016. ^ "Оперативная сводка штаба АТО на 06:00 – 08 августа" [Operational summary of ATO HQ as of 8 August (06:00)] (in Russian). NSDC. 8 August 2016. Retrieved 8 August 2016. ^ "Силы АТО отбили атаку ДРГ боевиков в Старогнатовке, - пресс-центр". 112.ua. 112 Ukraine. 2016-08-08. Retrieved 2016-08-08. ^ "Map (3000×2494), The situation in the eastern regions of Ukraine, as of 8 August 2016 (00:00)". NSDC. 8 August 2016. Retrieved 8 August 2016. ^ "В зоне АТО с начала суток зафиксировано 12 обстрелов, - пресс-центр". 112.ua. 112 Ukraine. 2016-08-08. Retrieved 2016-08-08. ^ "Сводные данные АТО – 08 августа" [Summary information on ATO as of 8 August] (in Russian). NSDC. 8 August 2016. Retrieved 8 August 2016. ^ "В Донбассе под обстрелами ранены 11 украинских военных". news.liga.net. Liga News. 2016-08-08. Retrieved 2016-08-08. ^ "Украинские каратели 320 раз обстреляли ДНР, есть жертвы". News Front - новостной Фронт. 2016-08-08. Retrieved 2016-08-09. ^ "Новости ЛНР: ВСУ 8 раз нарушили режим прекращения огня за сутки". News Front - новостной Фронт. 2016-08-08. Retrieved 2016-08-09. ^ a b "С начала суток на Донбассе зафиксировано 18 обстрелов боевиков, - штаб АТО". 112.ua (in Russian). 112 Ukraine. 8 August 2016. Retrieved 8 August 2016. ^ "Оперативная сводка штаба АТО на 06:00 – 09 августа" [Operational summary of ATO HQ as of 9 August (06:00)] (in Russian). NSDC. 9 August 2016. Retrieved 9 August 2016. ^ "Map (3000×2494), The situation in the eastern regions of Ukraine, as of 9 August 2016 (00:00)". NSDC. 9 August 2016. Retrieved 9 August 2016. ^ "С начала суток боевики 4 раза обстреляли позиции ВСУ на мариупольском направлении, - пресс-офицер". 112.ua (in Russian). 112 Ukraine. 9 August 2016. Retrieved 9 August 2016. ^ a b "Сводные данные АТО – 09 августа" [Summary information on ATO as of 8 August] (in Russian). NSDC. 2 August 2016. Retrieved 2 August 2016. ^ "Ukraine reports 1 KIA, 5 WIA in past 24 hours". UNIAN. 2016-08-09. Retrieved 2016-08-09. ^ "СМИ: украинские силовики за сутки около 570 раз обстреляли ДНР". Retrieved 2016-08-09. ^ "В ЛНР назвали фамилии украинских командиров, приказавших обстрелять Стаханов". News Front - новостной Фронт. 2016-08-09. Retrieved 2016-08-09. ^ Miller, Christopher (9 August 2016). "Guns Of August: Fears Of Full-Scale War Return As Casualties Mount In Ukraine". REF/RL. Retrieved 9 August 2016. ^ "За неделю в Харьковский военный госпиталь доставили свыше 50 бойцов из зоны АТО". 112.ua (in Russian). 112 Ukraine. 9 August 2016. Retrieved 9 August 2016. ^ "Боевики за минувшие сутки 62 раза обстреляли позиции сил АТО, - пресс-центр". 112.ua. 112 Ukraine. 2016-08-10. Retrieved 2016-08-10. ^ "Map (3000×2494), The situation in the eastern regions of Ukraine, as of 10 August 2016 (00:00)". NSDC. 10 August 2016. Retrieved 10 August 2016. ^ "Сводные данные АТО – 10 августа" [Summary information on ATO as of 10 August] (in Russian). NSDC. 10 August 2016. Retrieved 10 August 2016. ^ "Укрокаратели за сутки 711 раз нарушили "режим тишины" в ДНР". News Front - новостной Фронт. 2016-08-10. Retrieved 2016-08-10. ^ "ВСУ пять раз обстреляли позиции Народной милиции ЛНР". News Front - новостной Фронт. 2016-08-10. Retrieved 2016-08-11. ^ "ОБСЕ подтверждает гибель мирных жителей в результате обстрелов Донецка". News Front - новостной Фронт. 2016-08-11. Retrieved 2016-08-12. ^ "Боевики обстреляли Марьинку, ранены двое детей, - Аброськин". 112.ua (in Russian). 112 Ukraine. 10 August 2016. Retrieved 10 August 2016. ^ "Оперативная сводка штаба АТО на 06:00 – 11 августа" [Operational summary of ATO HQ as of 11 August (06:00)] (in Russian). NSDC. 11 August 2016. Retrieved 11 August 2016. ^ "Map (3000×2494), The situation in the eastern regions of Ukraine, as of 11 August 2016 (00:00)". NSDC. 11 August 2016. Retrieved 11 August 2016. ^ "Зведені дані АТО – 11 серпня" [Summary information on ATO as of 11 August] (in Ukrainian). NSDC. 11 August 2016. Retrieved 11 August 2016. ^ "Каратели киевской хунты 267 раз за сутки обстреляли прифронтовую территорию ДНР". News Front - новостной Фронт. 2016-08-11. Retrieved 2016-08-11. ^ "ВСУ обстреляли позиции Народной милиции ЛНР из танковых орудий". News Front - новостной Фронт. 2016-08-11. Retrieved 2016-08-11. ^ "Боевики обстреляли Широкино из гранатометов и БМП, - пресс-офицер" (in Russian). 112 Ukraine. 2016-08-11. Retrieved 2016-08-11. ^ "Meeting with permanent members of the Security Council". Kremlin.ru. 2016-08-11. Retrieved 2016-08-11. ^ "Putin discusses Crimea security after alleged Ukrainian incursions". Reuters. 2016-08-11. Retrieved 2016-08-11. ^ "Russia's Black Sea Fleet holds drills to counter underwater sabotage after foiled Crimea attack". RT. 2016-08-11. Retrieved 2016-08-11. More than 10 warships, MI-8 and Ka-27PS helicopters are taking part in the training. ^ a b "Владимир Путин о попытке диверсий в Крыму: Украина перешла к террору" [Vladimir Putin on diversion attempt in Crimea: Ukraine has descended to terror] (in Russian). RT. 2016-08-11. Retrieved 2016-08-11. ^ "Kyiv Accuses Russia Of Provocations As Moscow Deploys Missiles". REF/RL. 12 August 2016. Retrieved 12 August 2016. ^ Nichols, Michelle (2016-08-11). "U.N. Security Council to discuss Ukraine-Russia tensions on Thursday // Russian troop build-up could reflect 'very bad' intentions: Ukraine". Reuters. Retrieved 2016-08-11. ^ Rainsford, Sarah (14 August 2016). "Crimea tension: What is Russia's end game?". Moscow: BBC News. Retrieved 14 August 2016. ^ Trudolubov, Maxim. "It's the Security, Stupid". Kennan Institute. Retrieved 2016-08-15. ^ "Оперативная сводка штаба АТО на 06:00 – 12 августа" [Operational summary of ATO HQ as of 12 August (06:00)] (in Russian). NSDC. 12 August 2016. Retrieved 12 August 2016. ^ "Map (3000×2494), The situation in the eastern regions of Ukraine, as of 12 August 2016 (00:00)". NSDC. 12 August 2016. Retrieved 12 August 2016. ^ "Сводные данные АТО – 12 августа" [Summary information on ATO as of 12 August] (in Russian). NSDC. 12 August 2016. Retrieved 12 August 2016. ^ "Террористы обстреляли Попасную: погиб украинский военный". Liga News. 2016-08-12. Retrieved 2016-08-12. ^ "В Луганской обл. во время ночных обстрелов со стороны боевиков погиб один военнослужащий, двое получили ранения, - Гарбуз". 112 Ukraine. 2016-08-12. Retrieved 2016-08-12. ^ "Командование ДНР: ВСУ за неделю более 3100 раз обстреляли республику". News Front - новостной Фронт. 2016-08-12. Retrieved 2016-08-13. ^ "ВСУ шесть раз обстреляли позиции Народной милиции ЛНР". News Front - новостной Фронт. 2016-08-12. Retrieved 2016-08-13. ^ "Оперативная сводка штаба АТО на 06:00 – 13 августа" [Operational summary of ATO HQ as of 13 August (06:00)] (in Russian). NSDC. 13 August 2016. Retrieved 13 August 2016. ^ "Ukraine reports 61 attacks in Donbas in last 24 hours". www.unian.info. UNIAN. 2016-08-13. Retrieved 2016-08-13. ^ "Map (3000×2494), The situation in the eastern regions of Ukraine, as of 13 August 2016 (00:00)". NSDC. 13 August 2016. Retrieved 13 August 2016. ^ "В зоне АТО за минувшие сутки погиб военный, двое получили ранения, - Мотузяник" (in Russian). 112 Ukraine. 2016-08-13. Retrieved 2016-08-13. ^ "На мариупольском направлении ночью произошло 2 боестолкновения, - пресс-офицер" (in Russian). 112 Ukraine. 2016-08-13. Retrieved 2016-08-13. ^ ""Русская Весна" публикует полную сводку о военной ситуации в ДНР за 13 августа" (in Russian). Retrieved 2016-08-13. ^ "ВСУ пять раз обстреляли позиции Народной милиции ЛНР". News Front - новостной Фронт. 2016-08-13. Retrieved 2016-08-13. ^ "В ЛНР подвели недельные итоги противостояния Вооруженным силам Украины". News Front - новостной Фронт. 2016-08-13. Retrieved 2016-08-13. ^ "Оккупанты увеличили количество обстрелов на Донетчине" (in Russian). Liga News. 2016-08-13. Retrieved 2016-08-13. ^ "Оперативная сводка штаба АТО на 06:00 – 14 августа" [Operational summary of ATO HQ as of 14 August (06:00)] (in Russian). NSDC. 14 August 2016. Retrieved 14 August 2016. ^ "Боевики из противотанкового гранатомета обстреляли пешеходный мост в Станице Луганской". Retrieved 2016-08-14. ^ "В зоне АТО за минувшие сутки погибших военных нет, трое получили ранения, - Мотузяник" (in Russian). 112 Ukraine. 2016-08-14. Retrieved 2016-08-14. ^ "ВСУ 675 раз обстреляли ДНР". News Front - новостной Фронт. 2016-08-14. Retrieved 2016-08-14. ^ "ВСУ 10 раз обстреляли позиции Народной милиции ЛНР". News Front - новостной Фронт. 2016-08-14. Retrieved 2016-08-14. ^ "Map (3000×2494), The situation in the eastern regions of Ukraine, as of 15 August 2016 (00:00)". NSDC. 15 August 2016. Retrieved 16 August 2016. ^ "За минувшие сутки никто из украинских военнослужащих не погиб, один ранен, - Мотузяник" (in Russian). 112 Ukraine. 2016-08-15. Retrieved 2016-08-15. ^ "Укрофашисты за сутки 675 раз нарушили "режим тишины" в ДНР". News Front - новостной Фронт. 2016-08-15. Retrieved 2016-08-17. ^ SHARKOV, DAMIEN (2016-08-15). "UKRAINE REPORTS REPELLING SEPARATIST ATTACK AS HOSTILITIES CONTINUE". Newsweek. Retrieved 2016-08-15. ^ "Два военнослужащих Народной милиции погибли при обстреле со стороны ВСУ". News Front - новостной Фронт. 2016-08-15. Retrieved 2016-08-17. ^ "Двое военнослужащих ЛНР погибли при столкновении с украинской ДРГ - Новороссия". www.novorosinform.org. Retrieved 2016-08-17. ^ "Авдеевская промзона под минометным обстрелом, по предварительным данным двое раненых, - Дейдей" (in Russian). 112 Ukraine. 2016-08-15. Retrieved 2016-08-15. ^ "Donbas: Enemy mortars shelling Avdiivka, - MP". 112.ua (in Russian). 112 Ukraine. 15 August 2016. Retrieved 15 August 2016. ^ "Оперативная сводка штаба АТО на 06:00 – 16 августа" [Operational summary of ATO HQ as of 16 August (06:00)] (in Russian). NSDC. 16 August 2016. Retrieved 16 August 2016. ^ "Militants fire from mortar 150 times in Donetsk region, - ATO HQ". 112 Ukraine. 2016-08-16. Retrieved 2016-08-16. ^ "За минувшие сутки восемь украинских военных в зоне АТО получили ранения, – Мотузяник" (in Russian). 112 Ukraine. 2016-08-16. Retrieved 2016-08-16. ^ "ВСУ за минувшие сутки 578 раз обстреляли прифронтовые территории ДНР". News Front - новостной Фронт. 2016-08-16. Retrieved 2016-08-17. ^ "ВСУ пять раз обстреляли позиции Народной милиции ЛНР, применялись танки". News Front - новостной Фронт. 2016-08-16. Retrieved 2016-08-17. ^ a b "Donbas conflict: 20 attacks on Ukrainian positions over past 24 hours". 112 Ukraine. 2016-08-16. Retrieved 2016-08-17. ^ "Во время обстрела боевиками Чермалыка погиб волонтер из Бердянска - полиция" (in Russian). UNIAN. 16 August 2016. Retrieved 16 August 2016. ^ "Оперативная сводка штаба АТО на 06:00 – 17 августа" [Operational summary of ATO HQ as of 17 August (06:00)] (in Russian). NSDC. 17 August 2016. Retrieved 17 August 2016. ^ "АП: За минувшие сутки в зоне АТО ранения получили восемь украинских военных" (in Russian). 112 Ukraine. 2016-08-17. Retrieved 2016-08-17. ^ "Укронацисты за сутки 698 раз обстреляли прифронтовые территории ДНР". News Front - новостной Фронт. 2016-08-17. Retrieved 2016-08-18. ^ "ВСУ четыре раза обстреляли позиции Народной милиции ЛНР, применялись танки". News Front - новостной Фронт. 2016-08-17. Retrieved 2016-08-18. ^ "Ситуация в Донбассе обострилась: почти 50 обстрелов за день" (in Russian). Liga News. 17 August 2016. Retrieved 17 August 2016. ^ "Eastern Ukraine conflict: 45 attacks reported, - ATO HQ". 112 Ukraine. 17 August 2016. Retrieved 18 August 2016. ^ "Оперативная сводка штаба АТО на 06:00 – 18 августа" [Operational summary of ATO HQ as of 18 August (06:00)] (in Russian). NSDC. 18 August 2016. Retrieved 18 August 2016. ^ "Escalation of Donbas conflict: 96 attacks reported, - ATO HQ". 112 Ukraine. 18 August 2016. Retrieved 18 August 2016. ^ "Map (3000×2494), The situation in the eastern regions of Ukraine, as of 18 August 2016 (00:00)". NSDC. 18 August 2016. Retrieved 18 August 2016. ^ "Russian proxies attack Ukraine 96 times in last day amid escalation". UNIAN. 2016-08-18. Retrieved 2016-08-18. ^ "АП: За минувшие сутки в зоне АТО погибли трое украинских военных, шестеро были ранены". 112.ua (in Russian). 112 Ukraine. 2016-08-18. Retrieved 2016-08-18. ^ "Басурин: ВСУ за сутки 428 раз открывали огонь по ДНР, есть разрушения". News Front - новостной Фронт. 2016-08-18. Retrieved 2016-08-21. ^ "Новости Новороссии сегодня 18.08.2016: сводки ополченцев Новороссии". Retrieved 2016-08-21. ^ "Киевские силовики обстреляли Стаханов в ЛНР из крупнокалиберной артиллерии". News Front - новостной Фронт. 2016-08-18. Retrieved 2016-08-21. ^ "Donbas: Pro-Russian fighters use tank to shell Troitske". 112.ua (in Russian). 112 Ukraine. 18 August 2016. Retrieved 19 August 2016. ^ "Оперативная сводка штаба АТО на 06:00 – 19 августа" [Operational summary of ATO HQ as of 19 August (06:00)] (in Russian). NSDC. 19 August 2016. Retrieved 19 August 2016. ^ "Russian proxies attack Ukraine 73 times in last day". UNIAN. 2016-08-19. Retrieved 2016-08-19. An enemy sabotage and reconnaissance group was repelled in the village of Bohdanivka. ^ "Map (3000×2494), The situation in the eastern regions of Ukraine, as of 19 August 2016 (00:00)". NSDC. 19 August 2016. Retrieved 16 August 2016. ^ "Сводные данные АТО – 19 августа" [Summary information on ATO as of 19 August] (in Russian). NSDC. 19 August 2016. Retrieved 19 August 2016. ^ "АП: За минувшие сутки в районе АТО погибли двое украинских военных, восемь бойцов ранены" (in Russian). 112 Ukraine. 2016-08-19. Retrieved 2016-08-19. ^ "Киевские силовики девять раз обстреляли позиции Народной милиции". News Front - новостной Фронт. 2016-08-19. Retrieved 2016-08-21. ^ "За день боевики 21 раз обстреливали позиции ВСУ в зоне АТО, - штаб" (in Russian). 112 Ukraine. 2016-08-19. Retrieved 2016-08-19. ^ "Оперативная сводка штаба АТО на 06:00 – 20 августа" [Operational summary of ATO HQ as of 20 August (06:00)] (in Russian). NSDC. 20 August 2016. Retrieved 20 August 2016. ^ "Map (3000×2494), The situation in the eastern regions of Ukraine, as of 20 August 2016 (00:00)". NSDC. 20 August 2016. Retrieved 20 August 2016. ^ "Сводные данные АТО – 20 августа" [Summary information on ATO as of 20 August] (in Russian). NSDC. 20 August 2016. Retrieved 20 August 2016. ^ "Украинские каратели 480 раз нарушили режим прекращения огня в ДНР за сутки". News Front - новостной Фронт. 2016-08-20. Retrieved 2016-08-21. ^ "ВСУ семь раз обстреляли позиции Народной милиции ЛНР". News Front - новостной Фронт. 2016-08-20. Retrieved 2016-08-21. ^ "Russian occupation forces continue to commit armed provocations against the Forces of ATO". 112 Ukraine. 20 August 2016. Retrieved 20 August 2016. ^ "Оперативная сводка штаба АТО на 06:00 – 21 августа" [Operational summary of ATO HQ as of 21 August (06:00)] (in Russian). NSDC. 21 August 2016. Retrieved 21 August 2016. ^ "Intence fighting detected in Donetsk region, - ATO HQ". 112 Ukraine. 2016-08-21. Retrieved 2016-08-21. ^ "Map (3000×2494), The situation in the eastern regions of Ukraine, as of 21 August 2016 (00:00)". NSDC. 21 August 2016. Retrieved 16 August 2016. ^ "Сводные данные АТО – 21 августа" [Summary information on ATO as of 21 August] (in Russian). NSDC. 21 August 2016. Retrieved 21 August 2016. ^ "Басурин: ВСУ за сутки более 500 раз нарушили "режим тишины"". News Front - новостной Фронт. 2016-08-21. Retrieved 2016-08-21. ^ "ВСУ за сутки убили двух людей в ДНР – Басурин". News Front - новостной Фронт. 2016-08-21. Retrieved 2016-08-21. ^ "ВСУ четыре раза обстреляли позиции Народной милиции, применялись 152-мм орудия". News Front - новостной Фронт. 2016-08-21. Retrieved 2016-08-21. ^ "Оккупанты задействовали бронетехнику в Красногоровке - штаб" (in Russian). Liga News. 2016-08-21. Retrieved 2016-08-21. ^ "Пропускний пункт "Мар'їнка" обстріляли зі сторони "ДНР"" [Russian forces shelled Maryinka checkpoint] (in Ukrainian). Hromadske. 21 August 2016. Retrieved 21 August 2016. ^ "С гранатометов и пулеметов боевики обстреляли КПП "Марьинка", - Слободян" [Militants fired the checkpoint "Marinka" with grenade launchers and machine guns] (in Ukrainian). 112.ua. 21 August 2016. Retrieved 21 August 2016. ^ "Оперативная сводка штаба АТО на 06:00 – 22 августа" [Operational summary of ATO HQ as of 22 August (06:00)] (in Russian). NSDC. 22 August 2016. Retrieved 22 August 2016. ^ "Map (3000×2494), The situation in the eastern regions of Ukraine, as of 22 August 2016 (00:00)". NSDC. 22 August 2016. Retrieved 22 August 2016. ^ "Сводные данные АТО – 22 августа" [Summary information on ATO as of 22 August] (in Russian). NSDC. 22 August 2016. Retrieved 22 August 2016. ^ "Украинские каратели за сутки 189 раз обстреляли прифронтовые территории ДНР". News Front - новостной Фронт. 2016-08-22. Retrieved 2016-08-22. ^ "ВСУ трижды обстреляли позиции Народной милиции, применялись 152-мм орудия". News Front - новостной Фронт. 2016-08-22. Retrieved 2016-08-23. ^ "Pro-Russia militants continue to violate cease-fire state in Donbas region, - ATO HQ". 112 Ukraine. 22 August 2016. Retrieved 22 August 2016. ^ "Оперативная сводка штаба АТО на 06:00 – 23 августа" [Operational summary of ATO HQ as of 23 August (06:00)] (in Russian). NSDC. 23 August 2016. Retrieved 23 August 2016. ^ "Map (3000×2494), The situation in the eastern regions of Ukraine, as of 23 August 2016 (00:00)". NSDC. 23 August 2016. Retrieved 23 August 2016. ^ "Сводные данные АТО – 23 августа" [Summary information on ATO as of 23 August] (in Russian). NSDC. 23 August 2016. Retrieved 23 August 2016. ^ "Укрофашисты за сутки 290 раз нарушили "режим тишины" в ДНР". News Front - новостной Фронт. 2016-08-23. Retrieved 2016-08-23. ^ "Басурин: украинские каратели 290 раз за сутки нарушили режим прекращения огня, погиб военнослужащий ДНР - Новороссия". novorosinform.org. Retrieved 2016-08-24. ^ "ВСУ 5 раз обстреляли позиции Народной милиции, применялись 120-мм минометы". News Front - новостной Фронт. 2016-08-23. Retrieved 2016-08-24. ^ "Donbas: Heavy artillery, mortar fire reported in Donetsk region". 112.international. 112 Ukraine. 23 August 2016. Retrieved 24 August 2016. ^ "Зведені дані АТО – 23 серпня" [Summary information from ATO 23.08.2016] (in Ukrainian). NSDC. 2016-08-23. Retrieved 2016-08-23. ^ "Оперативная сводка штаба АТО на 06:00 – 24 августа" [Operational summary of ATO HQ as of 24 August (06:00)] (in Russian). NSDC. 24 August 2016. Retrieved 24 August 2016. ^ "Map (3000×2494), The situation in the eastern regions of Ukraine, as of 24 August 2016 (00:00)". NSDC. 24 August 2016. Retrieved 24 August 2016. ^ "Сводные данные АТО – 24 августа" [Summary information on ATO as of 24 August] (in Russian). NSDC. 24 August 2016. Retrieved 24 August 2016. ^ "Басурин заявил о 250 нарушениях прекращения огня на линии соприкосновения с ДНР". News Front - новостной Фронт. 2016-08-24. Retrieved 2016-08-27. ^ "Басурин: Шесть поврежденных домостроений и погибший мирный житель- итог ночных обстрелов ВСУ - Новороссия". novorosinform.org. Retrieved 2016-08-27. ^ "ВСУ 7 раз обстреляли позиции Народной милиции, применив 152-мм и 122-мм орудия". News Front - новостной Фронт. 2016-08-24. Retrieved 2016-08-27. ^ "Оккупанты портят праздник: у Авдеевки работают танки, а на Луганщине в ход пошла 152-миллиметровая артиллерия" (in Russian). UNIAN. 2016-08-24. Retrieved 2016-08-24. ^ ""Свобода": В зоне АТО в День Независимости погиб украинский военный Олег Дьяченко" (in Russian). 112 Ukraine. 24 August 2016. Retrieved 24 August 2016. ^ "Оперативная сводка штаба АТО на 06:00 – 25 августа" [Operational summary of ATO HQ as of 25 August (06:00)] (in Russian). NSDC. 25 August 2016. Retrieved 25 August 2016. ^ "Map (3000×2494), The situation in the eastern regions of Ukraine, as of 25 August 2016 (00:00)". NSDC. 25 August 2016. Retrieved 25 August 2016. ^ "Сводные данные АТО – 25 августа" [Summary information on ATO as of 25 August] (in Russian). NSDC. 25 August 2016. Retrieved 25 August 2016. ^ a b "Басурин: После Дня Независимости Украины ВСУ существенно увеличили обстрелы - Новороссия". novorosinform.org. Retrieved 2016-08-25. ^ "Обстановка в ДНР резко обострилась: ВСУ 695 раз обстреляли республику за сутки". News Front - новостной Фронт. 2016-08-25. Retrieved 2016-08-25. ^ "ВСУ 6 раз обстреляли ЛНР, применив 152-мм орудия". News Front - новостной Фронт. 2016-08-25. Retrieved 2016-08-25. ^ "Оперативная сводка штаба АТО на 06:00 – 26 августа" [Operational summary of ATO HQ as of 26 August (06:00)] (in Russian). NSDC. 26 August 2016. Retrieved 26 August 2016. ^ "Russian proxies attack Ukraine 48 times in past 24 hours, fire artillery near Avdiyivka". UNIAN. 26 August 2016. Retrieved 27 August 2016. ^ "Map (3000×2694), The situation in the eastern regions of Ukraine, as of 26 August 2016 (00:00)". NSDC. 26 August 2016. Retrieved 26 August 2016. ^ a b "Сводные данные АТО – 26 августа" [Summary information on ATO as of 26 August] (in Russian). NSDC. 26 August 2016. Retrieved 26 August 2016. ^ "Командование ДНР: ВСУ за неделю более 3000 раз атаковали Республику". News Front - новостной Фронт. 2016-08-26. Retrieved 2016-08-26. ^ "ВСУ четыре раза обстреляли позиции Народной милиции". News Front - новостной Фронт. 2016-08-26. Retrieved 2016-08-27. ^ "С начала дня боевики 27 раз открывали огонь по позициям ВСУ, – пресс-центр штаба АТО" (in Russian). 112 Ukraine. 2016-08-26. Retrieved 2016-08-26. ^ "В Широкино погиб волонтер, застреленный, вероятно, снайпером боевиков". 112 Ukraine. 26 August 2016. Retrieved 26 August 2016. ^ "Volunteer killed in Shyrokyne, targeted by terrorist sniper: police". UNIAN. 26 August 2016. Retrieved 27 August 2016. ^ "Контактная группа заявила о необходимости бессрочного прекращения огня с 1 сентября, - Олифер". 112.ua. Retrieved 2016-09-01. ^ "Latest from OSCE Special Monitoring Mission (SMM) to Ukraine, based on information received as of 19:30, 4 September 2016". OSCE Ukraine SMM. 5 September 2016. Retrieved 5 September 2016. ^ "Оперативная сводка штаба АТО на 06:00 – 27 августа" [Operational summary of ATO HQ as of 27 August (06:00)] (in Russian). NSDC. 27 August 2016. Retrieved 27 August 2016. ^ "ATO HQ: 88 shellings along entire demarcation line and massive artillery strike in Krymske". 112 Ukraine. 2016-08-27. Retrieved 2016-08-27. ^ "Map (3000×2494), The situation in the eastern regions of Ukraine, as of 27 August 2016 (00:00)". NSDC. 27 August 2016. Retrieved 16 August 2016. ^ "Сводные данные АТО – 27 августа" [Summary information on ATO as of 27 August] (in Russian). NSDC. 27 August 2016. Retrieved 27 August 2016. ^ "Новости ДНР: Укронацисты за прошедшие сутки 710 раз нарушили "режим тишины"". News Front - новостной Фронт. 2016-08-27. Retrieved 2016-08-29. ^ "ВСУ восемь раз обстреляли позиции Народной милиции". News Front - новостной Фронт. 2016-08-27. Retrieved 2016-08-29. ^ "Russian occupation troops 14 times violated the ceasefire in the area of ATO". 112 Ukraine. 2016-08-27. Retrieved 2016-08-27. ^ "Оперативная сводка штаба АТО на 06:00 – 28 августа" [Operational summary of ATO HQ as of 28 August (06:00)] (in Russian). NSDC. 28 August 2016. Retrieved 28 August 2016. ^ "Map (3000×2494), The situation in the eastern regions of Ukraine, as of 28 August 2016 (00:00)". NSDC. 28 August 2016. Retrieved 28 August 2016. ^ "Сводные данные АТО – 28 августа" [Summary information on ATO as of 28 August] (in Russian). NSDC. 28 August 2016. Retrieved 28 August 2016. ^ "Украинские каратели 297 раз открыли огонь по территории ДНР". News Front - новостной Фронт. 2016-08-28. Retrieved 2016-08-29. ^ "ВСУ 10 раз обстреляли позиции Народной милиции, применялись 152-мм орудия". News Front - новостной Фронт. 2016-08-28. Retrieved 2016-08-29. ^ "Оперативная сводка штаба АТО на 06:00 – 29 августа" [Operational summary of ATO HQ as of 29 August (06:00)] (in Russian). NSDC. 29 August 2016. Retrieved 29 August 2016. ^ "Map (3000×2494), The situation in the eastern regions of Ukraine, as of 29 August 2016 (00:00)". NSDC. 29 August 2016. Retrieved 31 August 2016. ^ "Сводные данные АТО – 29 августа" [Summary information on ATO as of 29 August] (in Russian). NSDC. 29 August 2016. Retrieved 29 August 2016. ^ "Басурин: ВСУ за сутки 525 раз нарушили "режим тишины"". News Front - новостной Фронт. 2016-08-29. Retrieved 2016-08-29. ^ "Басурин назвал имена пострадавших от обстрелов ВСУ граждан ДНР". News Front - новостной Фронт. 2016-08-29. Retrieved 2016-08-29. ^ "ВСУ семь раз обстреляли позиции Народной милиции, применялись 152-мм орудия". News Front - новостной Фронт. 2016-08-29. Retrieved 2016-08-29. ^ "Pro-Russia gunmen continue to use heavy artillery, - ATO HQ". 112 Ukraine. 2016-08-29. Retrieved 2016-08-30. ^ "Оперативная сводка штаба АТО на 06:00 – 30 августа" [Operational summary of ATO HQ as of 30 August (06:00)] (in Russian). NSDC. 30 August 2016. Retrieved 30 August 2016. ^ "Escalation of Donbas conflict continues, - ATO HQ". 112.international. 112 Ukraine. 2016-08-30. Retrieved 2016-08-30. ^ "Map (3000×2494), The situation in the eastern regions of Ukraine, as of 30 August 2016 (00:00)". NSDC. 30 August 2016. Retrieved 30 August 2016. ^ "Сводные данные АТО – 30 августа" [Summary information on ATO as of 30 August] (in Russian). NSDC. 30 August 2016. Retrieved 30 August 2016. ^ "ВСУ за сутки более 300 раз нарушили "режим тишины", есть пострадавшие". News Front - новостной Фронт. 2016-08-30. Retrieved 2016-08-30. ^ "В ЛНР заявили о 14 нарушениях режима "тишины" украинской стороной". News Front - новостной Фронт. 2016-08-30. Retrieved 2016-08-30. ^ "Оперативная сводка штаба АТО на 06:00 – 31 августа" [Operational summary of ATO HQ as of 31 August (06:00)] (in Russian). NSDC. 31 August 2016. Retrieved 31 August 2016. ^ ""Один из лучших штурмовиков": в районе Донецка от пули снайпера погиб боец ПС (фото)" (in Russian). UNIAN. 2016-08-31. Retrieved 2016-08-31. ^ "Map (3000×2494), The situation in the eastern regions of Ukraine, as of 31 August 2016 (00:00)". NSDC. 31 August 2016. Retrieved 31 August 2016. ^ "Сводные данные АТО – 31 августа" [Summary information on ATO as of 31 August] (in Russian). NSDC. 31 August 2016. Retrieved 31 August 2016. ^ "Spot Report by OSCE Special Monitoring Mission to Ukraine (SMM): SMM evacuates forward patrol base in Shchastia due to mortar shelling". OSCE. 31 August 2016. Retrieved 31 August 2016. ^ "ВСУ более 400 раз атаковали ДНР за сутки". News Front - новостной Фронт. 2016-08-31. Retrieved 2016-08-31. ^ "В ДНР назвали имена погибшего и раненых из-за обстрела ВСУ людей". News Front - новостной Фронт. 2016-08-31. Retrieved 2016-08-31. ^ "Власти ЛНР заявили о восьми нарушениях "режима тишины" со стороны Украины". News Front - новостной Фронт. 2016-08-31. Retrieved 2016-08-31. ^ "За день боевики 12 раз обстреляли позиции ВСУ в зоне АТО, - штаб" (in Russian). 112 Ukraine. 2016-08-31. Retrieved 2016-08-31. ^ "Donbas conflict: 12 attacks reported, - ATO HQ". 112 Ukraine. 2016-08-31. Retrieved 2016-09-01.